After several years without a multiplex theater, Riverside's Galleria at Tyler mall is once again lighting up the big screen following last weekend's opening of the AMC Tyler 16. 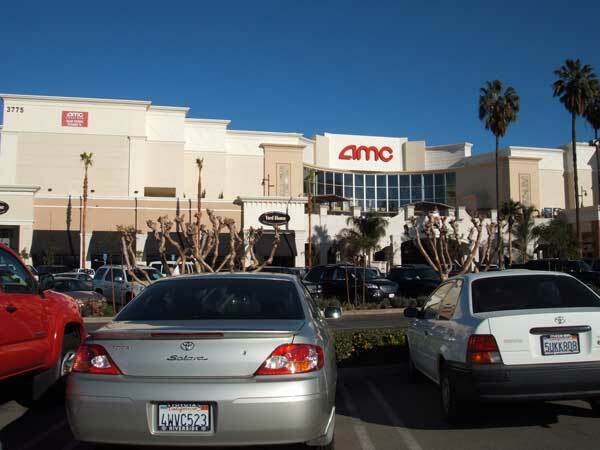 As part of the mall's "North Village" expansion, the AMC theater replaces the center's original UA Theater that was cleared to make way for a free-standing Barnes & Noble in 2001. Also included in the outparcel expansion are two restaurants (Yard House and Elephant Bar), a Robbins Bros. store as well as an expanded Hughes Alley parking garage. The 105,000 sq. ft. addition ups the mall's GLA to 1.2 million sq. ft. 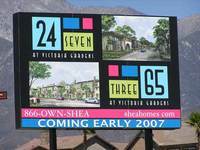 The "North Village" addition comes on the heels of last month's opening of a 20,000 sq. ft. H&M clothing store inside the mall itself, and completes the center's recent expansion that began in 2006 with the opening of free-standing P.F. Chang's and The Cheescake Factory restaurants. Slideshow: Then & Now - "North Village"
After many years of planning and 3+ years of construction, Caltrans is adding the finishing touches to the newly-built flyovers for the 60/91/215 interchange project in downtown Riverside. 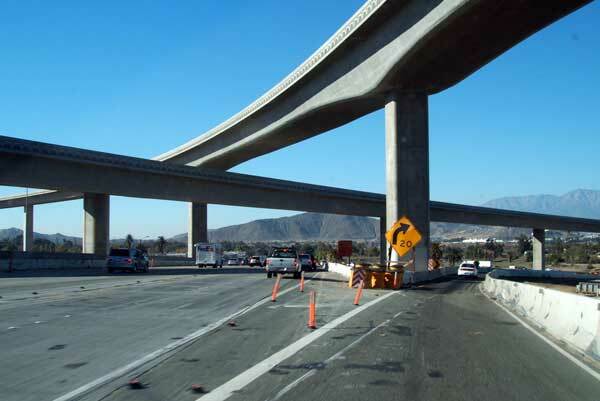 Although construction will continue on other aspects of the freeway project until about mid-2008, the flyovers are scheduled to open for traffic the last week of December. The two freeway-to-freeway connectors -- northbound 60/215 to westbound 91 and southbound 215 to eastbound 60/215 -- are the main aspects of the $350+ million project, which also includes additional lanes and rebuilt bridges, mostly along a 5 mile stretch along the 60/215 toward Moreno Valley. Long considered one of the region's worst bottlenecks, the project will greatly expand capacity of the 1950s-era cloverleaf and adjoining tributaries. The interchange was one of the primary projects promised from the county's half-cent transportation sales tax, first passed by voters in 1988. 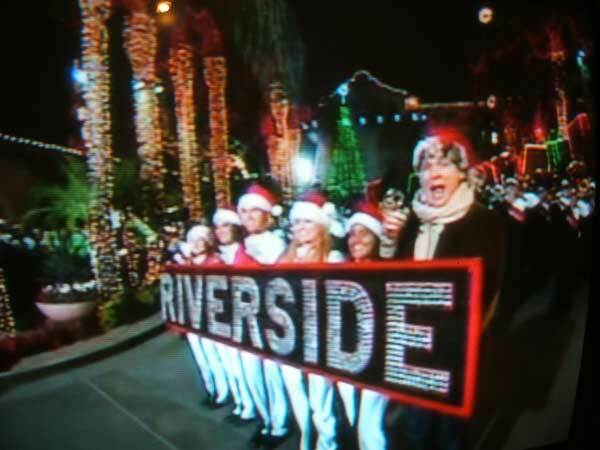 Last Friday, weatherman Sam Champion of ABC-TV's Good Morning America paid a visit to downtown Riverside for a special broadcast highlighting the Mission Inn's "Festival of Lights." The live broadcast was part of GMA's weeklong, "Light up the Holidays" special, wherein 5 different holiday displays from across the U.S. were featured during the program's weather segments. GMA visits the "Festival of Lights"
For those who missed the broadcast, InstantRiverside.com has a report here. For those interested in visiting the FOL, the festival runs nightly through Jan. 1, 2008. We suggest parking in one of the three Orange Street parking garages in downtown, particularly if you're visiting Friday, Saturday or Sunday evenings (parking is free after 5 p.m. and all day on the weekends). 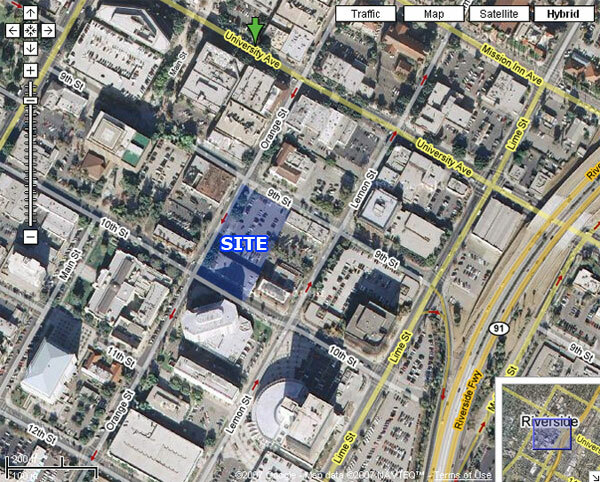 A fourth garage is also available off Market Street between Mission Inn and University avenues. This is the 15th year of the FOL, which began as a modest, hotel-only holiday lights event that has since grown to include over 3 million lights, animated figures, carolers, carriage rides and a small ice skating rink on the Main Street Pedestrian Mall. Have you ever walked through an art museum and said to yourself, "Wow, I wish I could purchase that right off the wall." Well, this week you can during the annual "Off The Wall" fundraiser at the Riverside Art Museum. 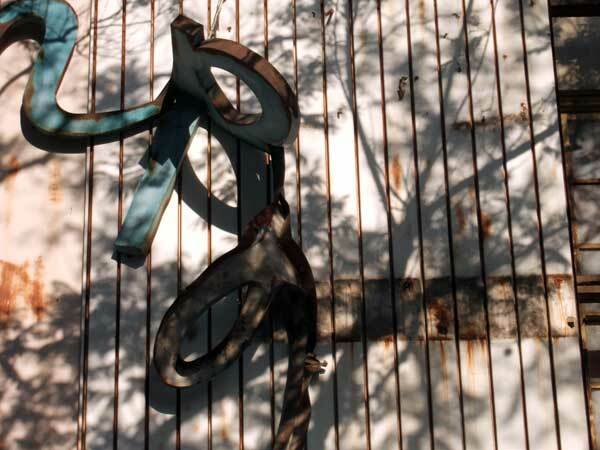 Designed as both an exhibit and a fundraiser, the event showcases over 1,200 pieces from local artists in various mediums, ranging from the eclectic to the traditional. See something you like? Simply take it off the wall for purchase. Best of all, the pricing is simple -- and very affordable: $100, $200 or $300. New pieces go up as sales are made, thus new items are added each day. The event runs through Saturday, November 10. While you're perusing the art, imagine stepping back in time when the Julia Morgan-designed facility served as the downtown home for the YWCA. Built in 1929, the building once sported an indoor pool (a.k.a., "the plunge") as well as a gymnasium, both of which were converted into separate gallery spaces shortly after the building was acquired for the museum in 1967. 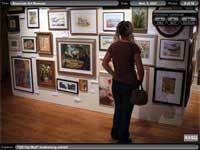 Finally, before heading out, you'll want to browse the museum's gift store for crafts and other items of local interest. 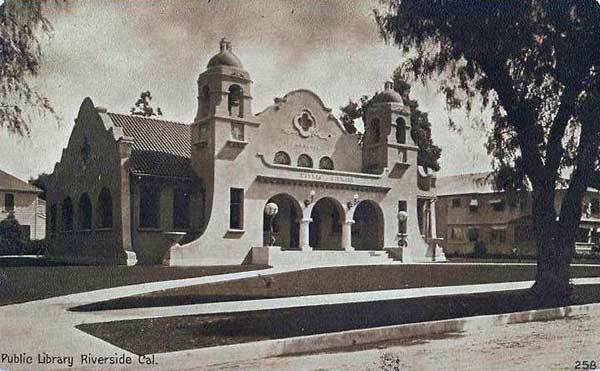 The museum is located at 3245 Mission Inn Avenue in downtown Riverside and is open Mon - Sat, 10 a.m. - 4 p.m. (until 9 p.m. during "Riverside Arts Walk" on the first Thursday of each month). 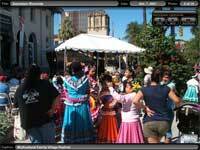 Saturday, October 6, 2007 - This past Saturday, if one ventured down to the weekly Farmers Market held on the pedestrian mall in downtown Riverside, they couldn't help but hear the sounds from a multicultural festival just two blocks away. 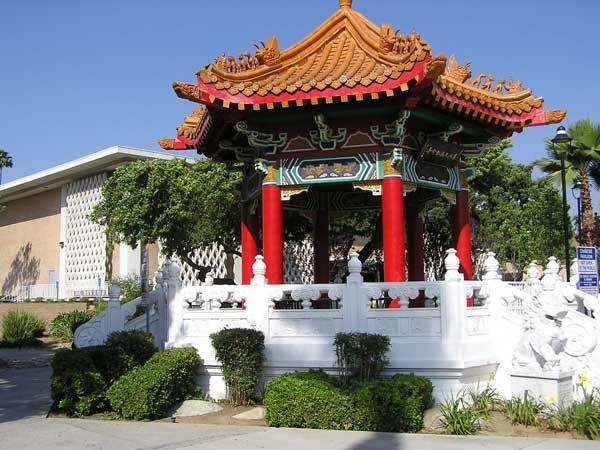 The 9th Annual "Multicultural Family Village Festival" took place in front of the Riverside Metropolitan Museum, located on Mission Inn Avenue at Orange Street. Sponsored by the city-run museum, the modest festival included music, dance, arts & crafts and food from a number of local community groups. The event gave us an excuse to revisit a special exhibit inside the Metropolitan Museum itself. The exhibit is the first of a two-part exhibit, "The Mission Inn: Celebrating 30 Years as a National Historic Landmark," which is being shared with the nearby Mission Inn Museum. Part one -- "Creating a Legacy (1875 - 1955)" -- showcases personal artifacts from the Miller family during the Inn's early days, including paintings, photographs and a few pieces of furniture. Also on display is the original sketch (and U.S. Patent) for the Raincross symbol. The exhibit ends its 3-month run on October 14. Part two -- "Saving the Community's Heritage (1955 - present)" -- documents the Inn during rough times following the end of the Miller family stewardship, the subsequent ownership changes and selling off of some of the Inn's treasures, the eventual multi-million dollar refurbishment and recent revival. 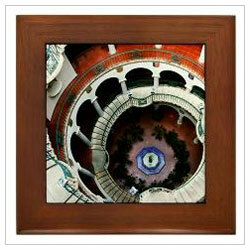 This second exhibit opened last month at the Mission Inn Museum and runs through January 5, 2008. Admission to both museums is free (though a nominal donation of $2 is gladly accepted). 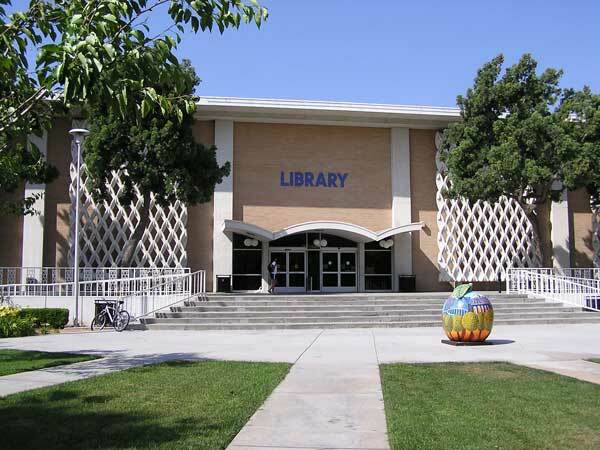 Rising seven spots from last year, the University of California at Riverside continues its upward climb in the latest rankings of the nation's top higher-learning institutions as compiled by Washington Monthly. The #15 ranking is another indication that UCR -- and the UC system in general -- remains one of the top public educational institutions in the nation. Unlike other college guides, such as U.S. News and World Report, this guide asks not what colleges can do for you, but what colleges are doing for the country. It's a guide for all Americans who are concerned about our institutions of higher learning. Are our colleges making good use of our tax dollars? Are they producing graduates who can keep our nation competitive in a changing world? Are they, in short, doing well by doing good? 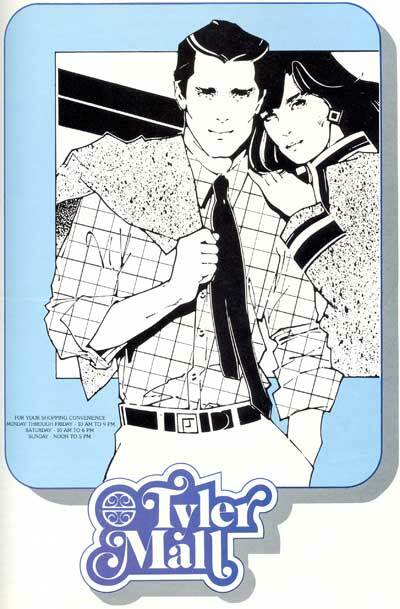 This is the guide that tells you. As such, 8 of 10 schools in the UC system are ranked, including 3 in the top 5: UCLA (2), Berkeley (3) and UC San Diego (4). While 2 others rank in the top 15: UC Davis (8) and UC Riverside (15). UC Santa Barabara (36), UC Irvine (49) and UC Santa Cruz (76) round out the UC rankings. Locally, other large schools ranked as follows: USC (24), Pepperdine (56), University of San Diego (97), Caltech (141), San Diego State (145) and University of La Verne (186). Texas A&M ranked first. But many other well-known national colleges didn't fare so well: Texas Tech (217), DePaul (150), Wake Forest (122), Arizona State (113), Boston College (109), Rice (103), Auburn (86), Princeton (78), BYU (68), Purdue (46), Vanderbilt (39) and Duke (29). Two highly-regarded Ivy League schools -- Yale and Harvard -- were listed at 38th and 27th respectively. Also of note were the rankings of a few local liberal arts schools: Claremont McKenna College (6), Pomona College (46) and Harvey Mudd College (65). 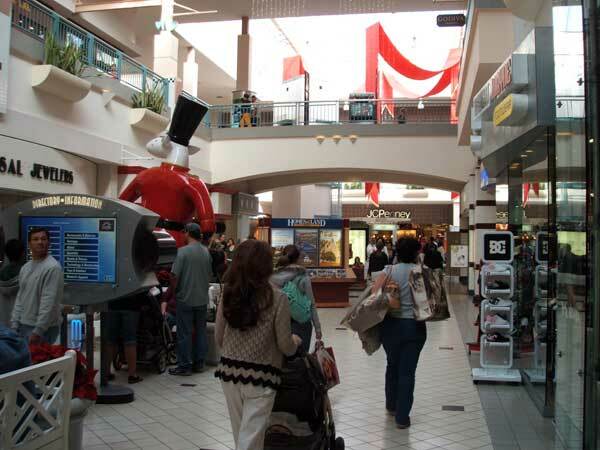 Since its opening as the single-level Tyler Mall in 1970 and re-christening as the two-level Galleria at Tyler in 1991, Riverside's primary shopping center remains one of Inland Southern California's top retail destinations. 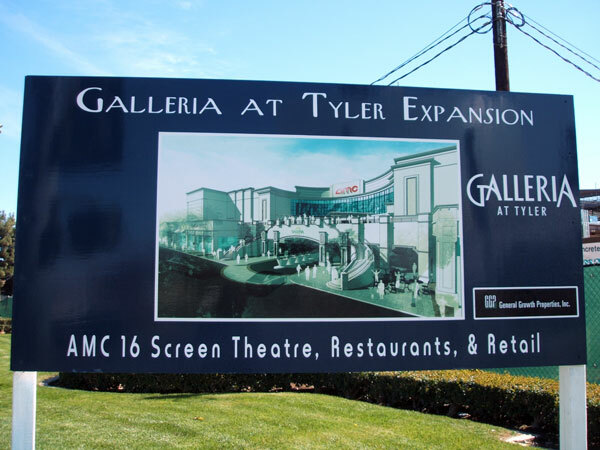 Currently undergoing its third major expansion, the Galleria at Tyler has flourished as both the city and the Inland region have grown and prospered. 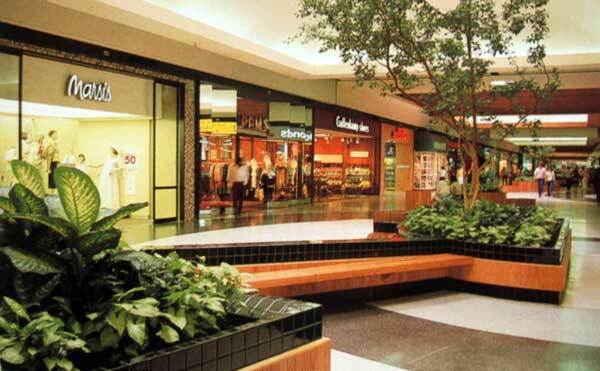 Below is Part 2 in a brief history of the Riverside mall. Part 1 can be found here. 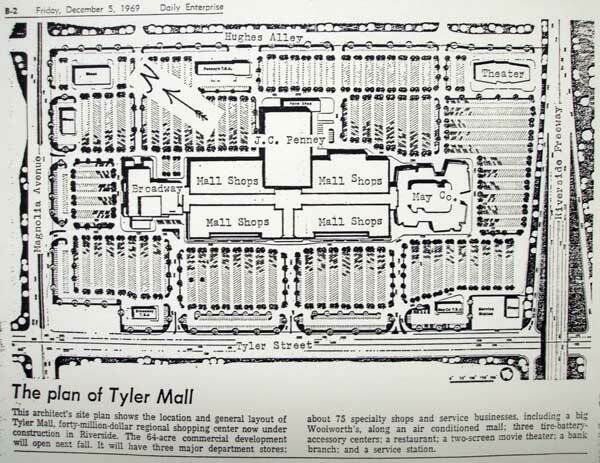 By the early 1980s, both residents and city officials alike began voicing opinions about the lack of an upscale department store at the then Tyler Mall. And although Buffum's considered the area in the late-1960s and Bullock's officials had recently began scouting the area, neither brand had yet committed to building a local store. In 1985, Seattle-based Nordstrom took the initiative and began work on the region's first upscale department store in nearby Montclair. And by late 1986, following a successful opening at Montclair Plaza, Nordstrom began scouting for a second area location. 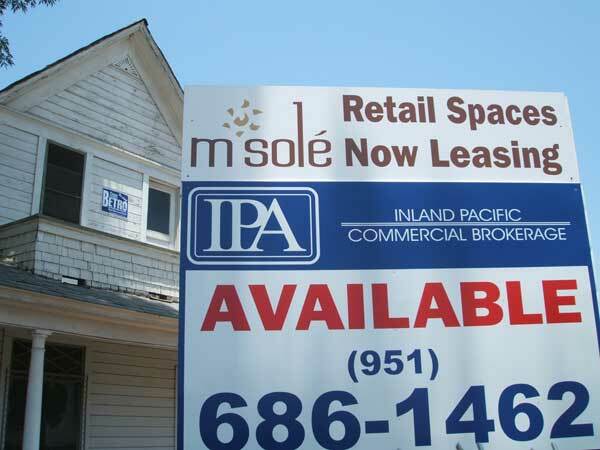 The upscale retailer took particular interest in Montclair's sibling mall in Riverside, which was in the midst of planning a similar expansion. 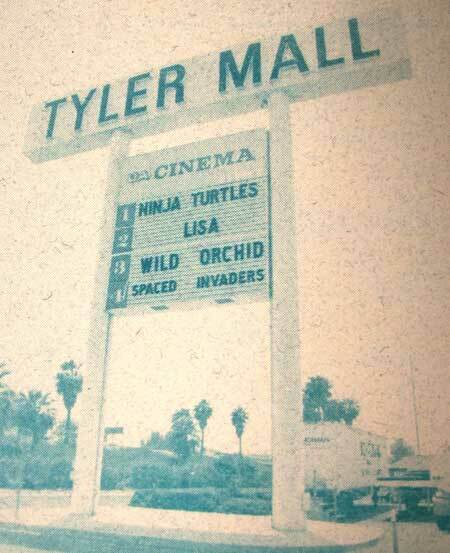 In April 1987, Nordstrom made it official -- a store was planned for an expanded Tyler Mall. However, the mall expansion would be delayed by local politics -- and local competition. 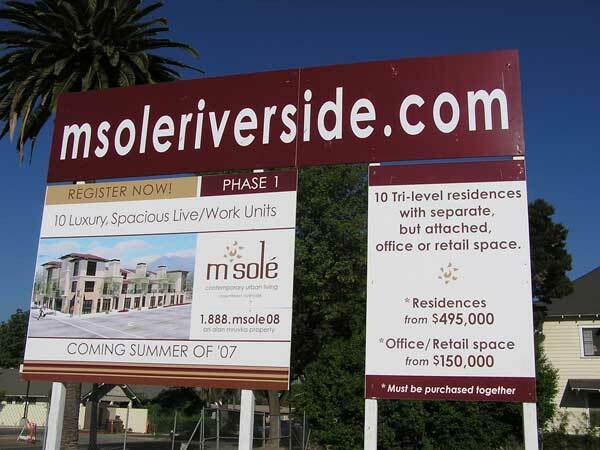 Earlier in the decade, Riverside annexed the site for a proposed regional mall on the city's eastern edge near the soon-to-be city of Moreno Valley. 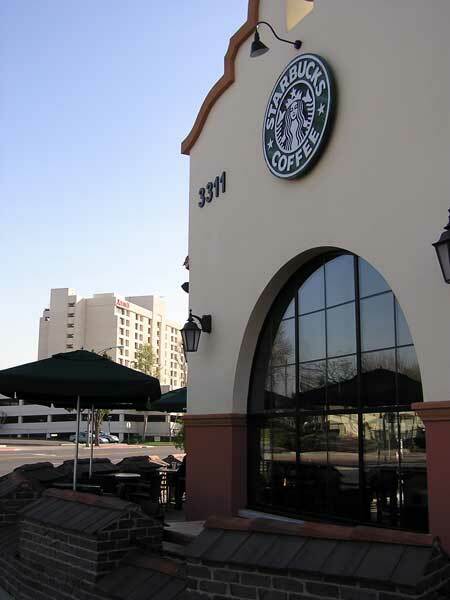 The mall, dubbed Canyon Springs Fashion Mall*, was proposed by Riverside-based T&S Development, developers of Riverside's highly-successful Canyon Crest Towne Centre. The two-level, 1.3 million sq. 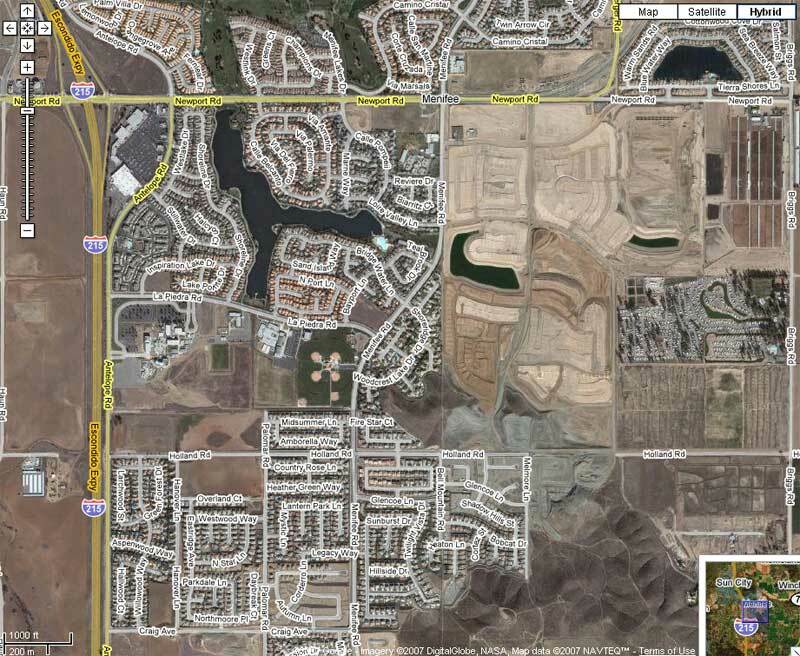 ft. mall (with 6 to 8 department stores) was part of the master-planned "Canyon Springs"* development proposed on 900 acres owned by T&S at the conjunction of Highway 60 and Interstate 215. 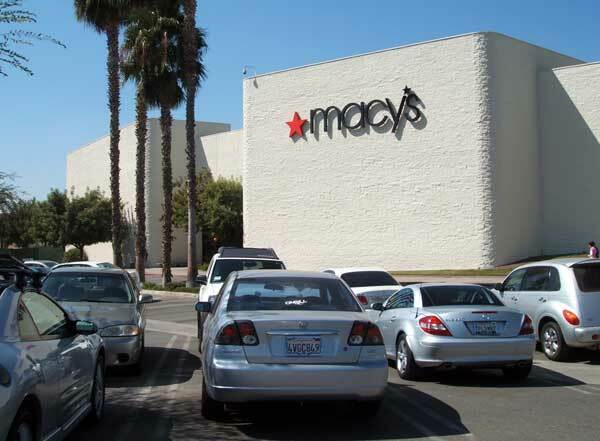 The Riverside City Council, seeking to boost revenues and fulfill a community desire for upscale shopping, yesterday voted 6-1 to approve plans to nearly double the size of the Tyler Mall, including construction of a Nordstrom and J.W. Robinson's. On the same day in March 1989, both T&S and the local residents group filed separate lawsuits aiming to block the expansion. But by December 1989, after key setbacks in court -- including the revelation of a thinly-veiled link between the two groups -- both lawsuits were dropped following out-of-court settlements, thus paving the way for expansion to finally begin. 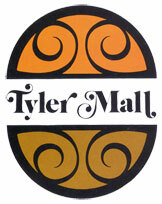 "Tyler, upon completion, will appear to be a brand new mall...Everything will change. Nothing will be the same. Every piece of wall and floor will change." 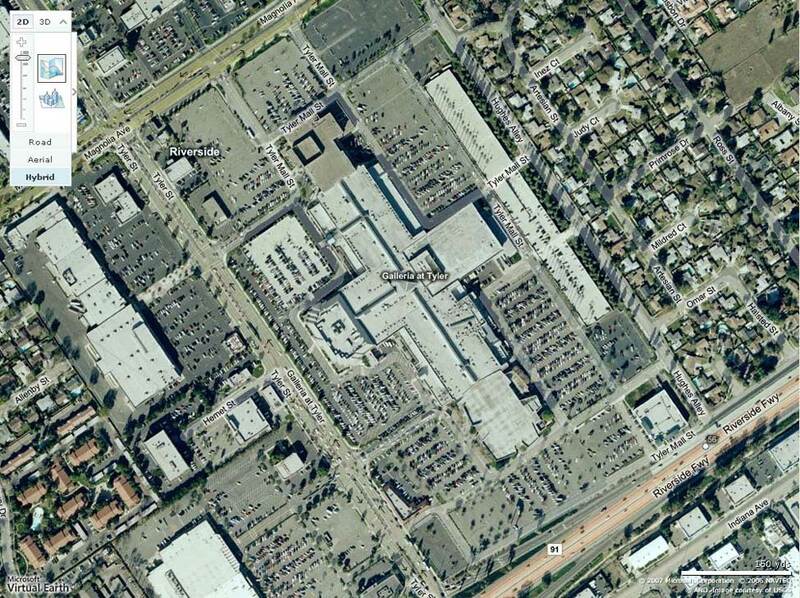 Expansion plans for the mall closely followed those undertaken in 1985 at Montclair Plaza, also owned at the time by Newport Beach-based Donahue-Schriber. 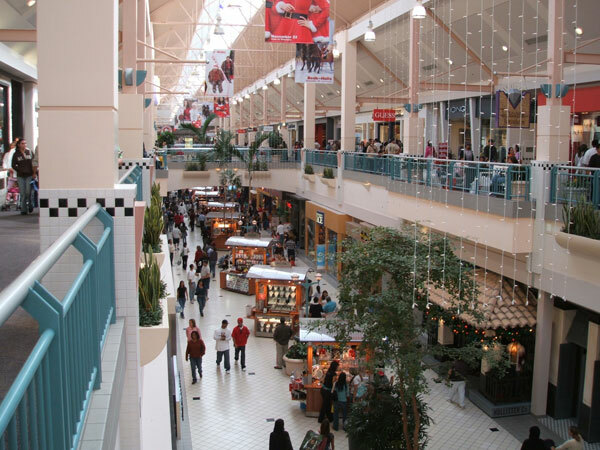 However, unlike Montclair's expansion, one major change would be how the second level of mall shops was added. In Montclair, the second level was placed directly on the existing roof resulting in a taller overall structure. However, this also caused the new level to be a few feet higher than the second-story levels of the existing department stores. This required a gradual lowering of the mall's new second level walkways immediately heading into the department stores (including a customized mini-escalator heading into The Broadway). In Riverside, a relatively new technique was used in which the second level would be suspended from a truss system designed to rest a few feet below the existing roof level. 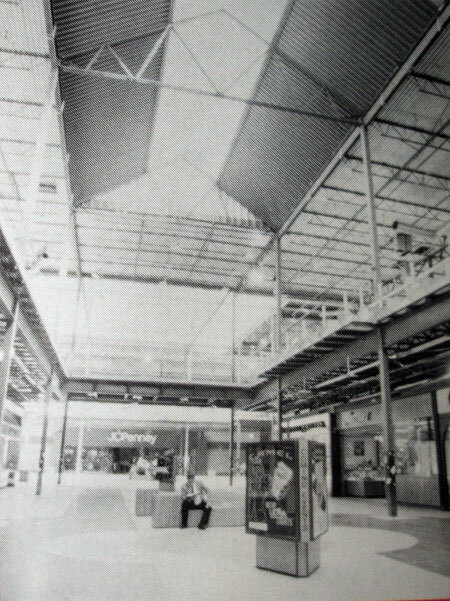 As such, the ceilings in the existing mall stores had to be lowered to accommodate the newly-built second level above. The result was matching floor levels and a shorter overall structure. It was more expensive, but according to Donahue-Schriber, was less disruptive to both shoppers and merchants as fewer overall support columns were needed (the added weight was distributed across the new truss system). 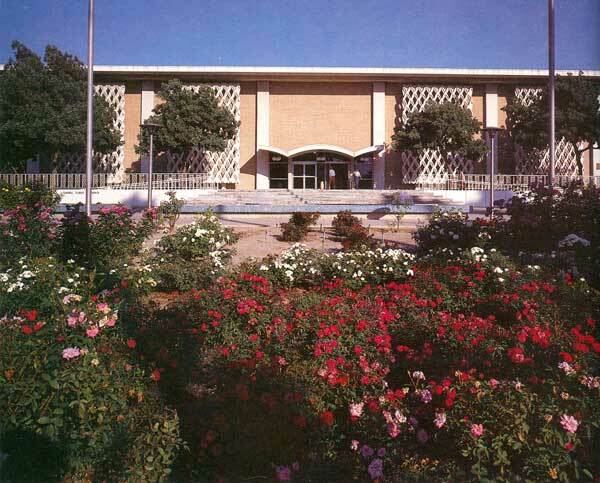 Seventeen months after construction began, an expanded Tyler Mall officially opened on October 17, 1991 as the newly-christened Galleria at Tyler. Shoppers eagerly welcomed the doubling of mall shops (from 85 to 160), more parking and, of course, the long-awaited Nordstrom**. 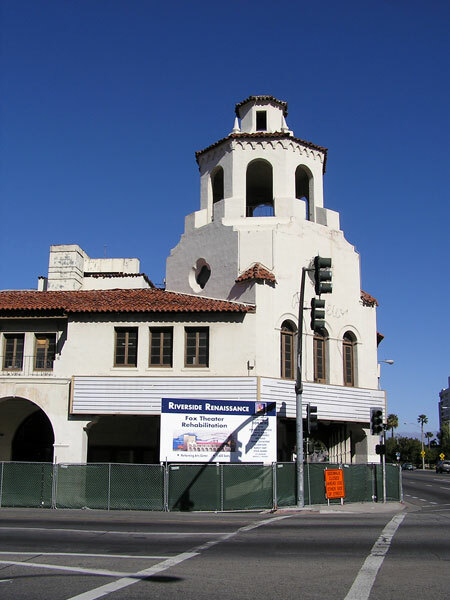 In 2001, Barnes & Noble replaced the original United Artists cinema located on Hughes Alley adjacent to the 91 Freeway. The theater, which originally opened with 2 theatres, was quickly doubled to 4 shortly after the mall opened. A 1978 proposal to double again to 8 screens failed to receive city approval. By the mid-1990s, the small theater was struggling to compete against the rise of mega-multiplexes. 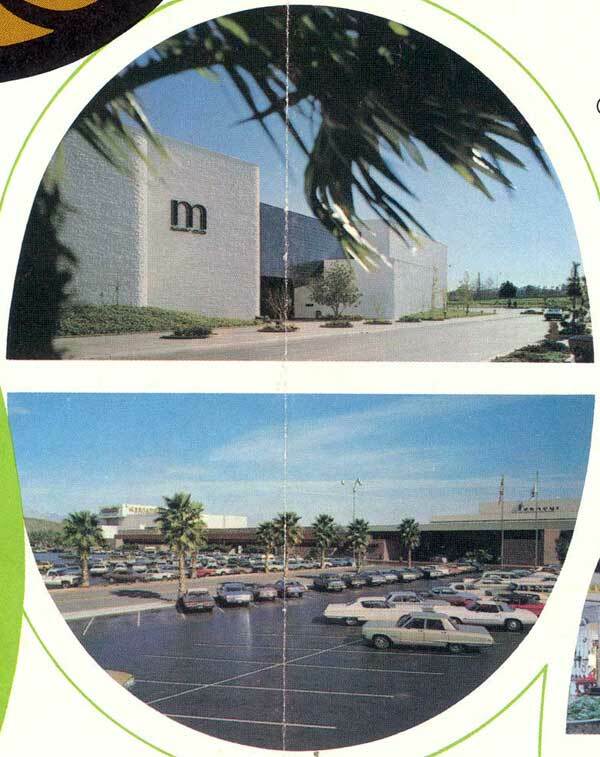 Various mall expansion plans floated in the late 1990s and early 2000s envisioned the UA 4 being replaced with a modern multiplex (including plans for a subterranean version). 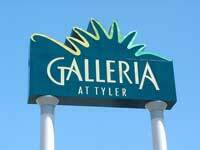 In July 2006, the Galleria at Tyler embarked on its third major expansion. The plans, which are taking place at out-parcels at opposing ends of the mall, include a multiplex theater, restaurants, additional retail and an expanded parking structure. First to open in late 2006 were The Cheesecake Factory and PF Chang's restaurants, both on the south end of the mall. 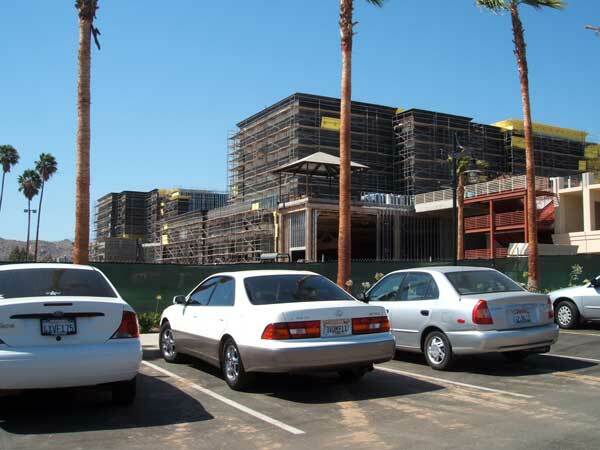 And by July 2007, work was well underway at the north end of the mall property for what is being dubbed "North Village," which will house an AMC 16 theater multiplex, Elephant Bar and Yard House restaurants, a Robbins Bros. store as well as additional shops. 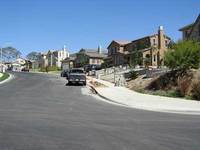 Architects for the project are MBH Architects of Alameda, CA. Completion is slated for late 2007. Elsewhere in the mall, the tenant mix continues to be updated. Recent additions include specialty shops the likes of Metropark, LoveSac, Coach and Aldo. In November 2007, Swedish fashion retailer H&M is set to open a 20,000 sq. ft. store at the mall's north end. Speculation for the now vacant building ranges from signing another department store -- such as Macy's sister store Bloomingdale's -- to revamping the 164,000 sq. ft. interior into micro shops (which, at the very least, would preserve the building). Another possibility, of course, is a complete tear down for further mall expansion. Though we'd definitely hate to see a vacant anchor for an extended number of years, we'd also hate to lose such an iconic architectural landmark. 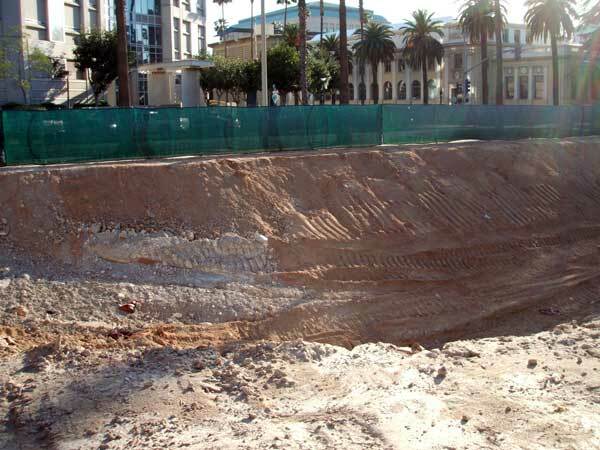 Moreover, what would become of the time capsule buried in 1970 by The Broadway, which states it's to be reopened in 2070? We suspect only time -- and future department store mergers -- will tell. 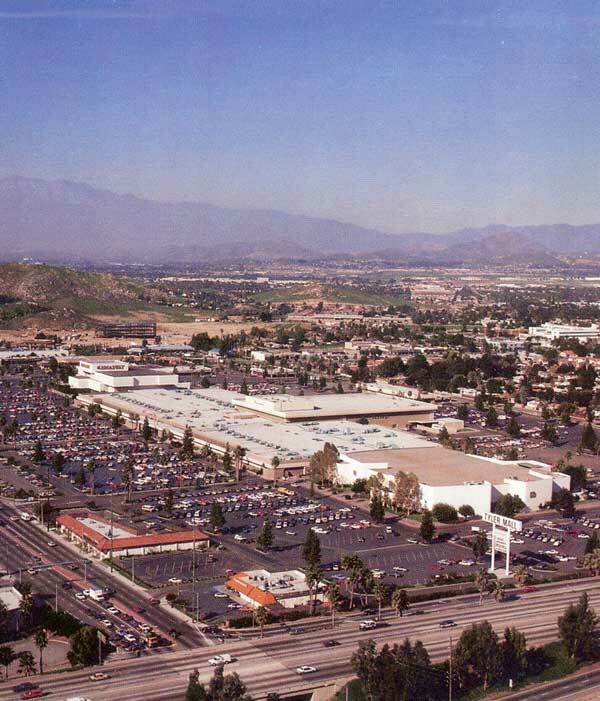 ** 1991 / Nordstrom, Inc.
Below is Part 1 in a brief history of the Riverside mall, which is currently owned and managed by General Growth Properties, Inc. 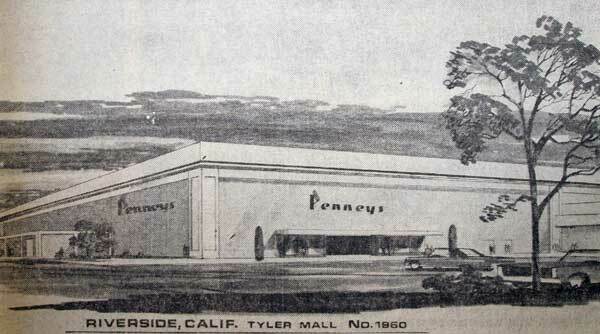 Although the Tyler Mall did not open until October 1970, development of it began in 1965 as representatives from regional and national department stores began taking interest in two competing mall developments proposed for Riverside. 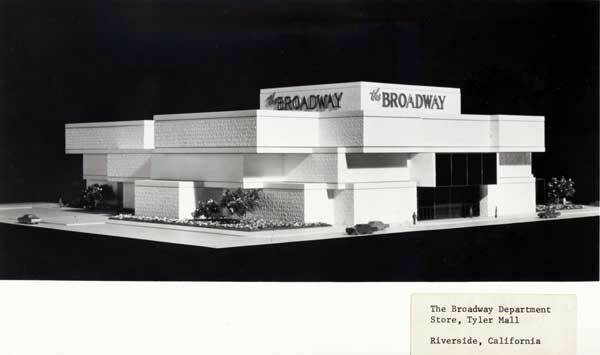 Broadway and May Co. executives say they plan to begin building department stores on the 66-acre Hunter Penn shopping center site at Magnolia and Tyler in Riverside in late 1966 or early 1967. On Sept. 4, Buffum's Department Stores revealed that Meairs has a letter committing Buffum's to a store at the Magnolia Mall center if certain other major stores also become tenants. 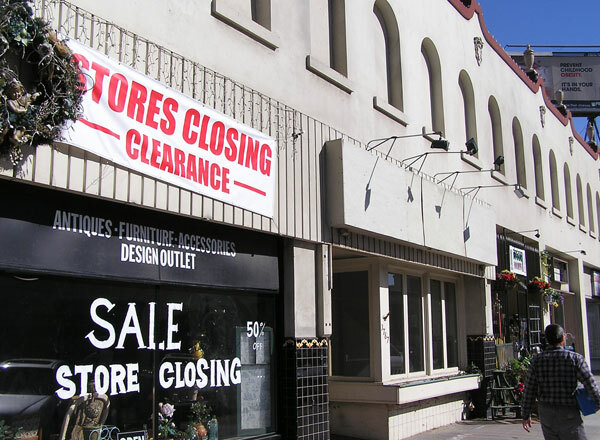 Retail experts at the time agreed the city could not support both proposals, particularly with two similar-sized malls also proposed nearby in San Bernardino (Inland Center) and Montclair (Montclair Plaza). Likewise, those proposals included May Co. and Broadway stores, with the Montclair site also controlled by developer Hunter Penn. In mid-1966, both The Broadway and May Co. bought out Hunter Penn's interest in the Montclair and Riverside sites with the Tyler property reportedly costing $2 million, or an average of $33,000 per acre. 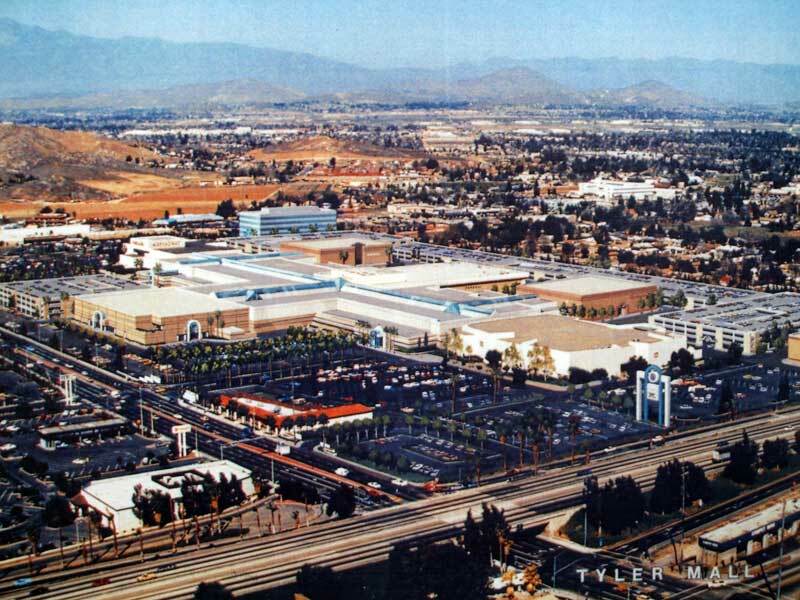 Although Riverside originally approved zoning for both the Tyler and Magnolia malls, which actually led to a delay in construction, the Tyler site eventually became the preferred site. Its location on what was then sheep grazing land sat adjacent to the Tyler Street exit off the Riverside Freeway. Major construction began in October 1969 with the mall officially opening one year later on October 12, 1970*, ushering a new era of shopping to Riverside. 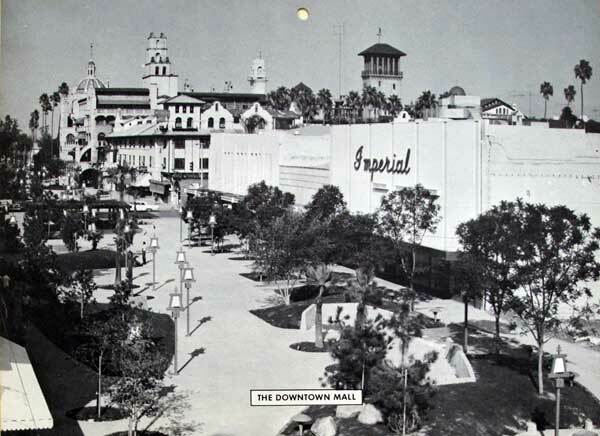 Already familiar with the mall concept via the 1956 opening of the outdoor Riverside Plaza -- one of the first mall-like developments within Southern California -- the city welcomed this new enclosed version with open arms -- and open pocket books. With 68 original stores (soon to be 85), including two department store anchors (The Broadway, JCPenney, plus a third pad) and a 61,000 square foot, two-level F.W. Woolworth, the 800,000 square foot Tyler Mall was nearly twice as large as its older cross-town cousin. 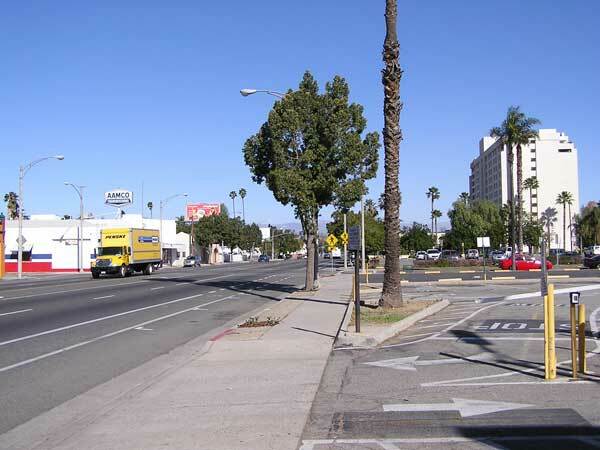 Several exterior buildings, including a twin theater (United Artists), free-standing bank (United California Bank), two restaurants (Howard Johnson's, Farrell's Ice Cream Parlour), two auto centers (JCPenney, Broadway) and a gas station rounded out the property. 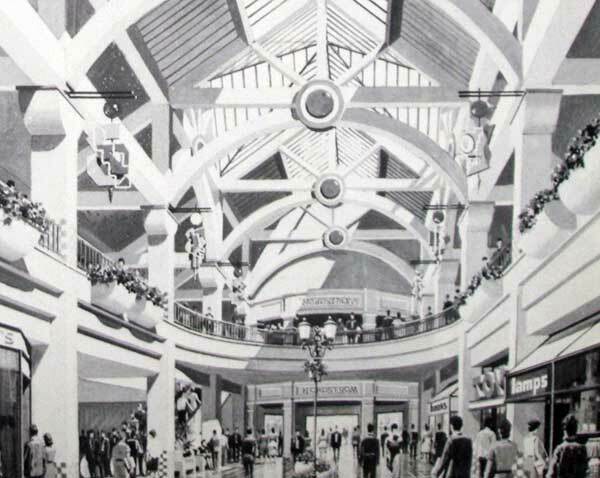 After a three-year delay in finalizing a new interior prototype, the May Co. building opened in July 1973, anchoring the south end of the mall. Containing a restaurant and cocktail lounge, the $5.5 million store was among the first stores to introduce the company's new retailing concept. With the exception of The Broadway and May Co. buildings, the mall's original exterior was rather conservative, uniform and perfunctory. Rough textured, beige brick dominated the overall look with walls hiding the exterior utility corridors. Four entrances, two on each side, graced the north and south ends of the mall near the department stores. 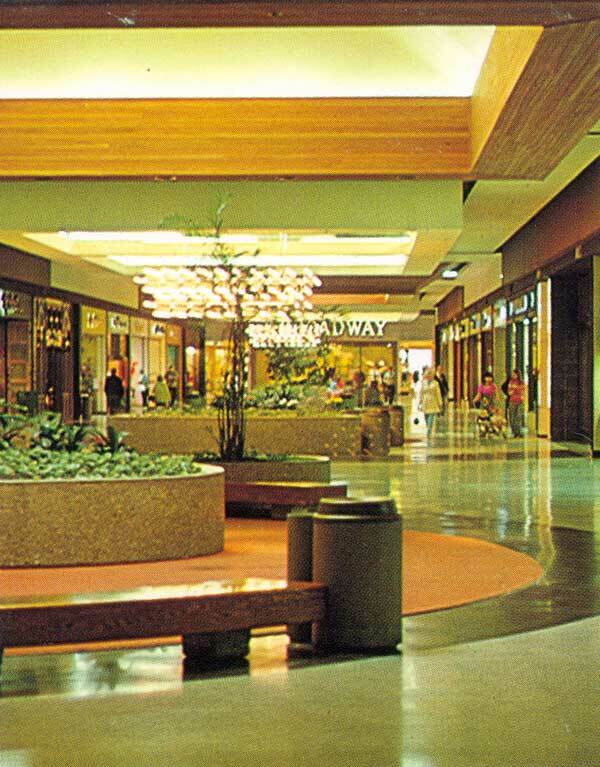 At the center of the 1000-foot linear mall was a short corridor housing more stores and the main entrance**, which faced west toward Tyler Street (where Nordstrom stands today). 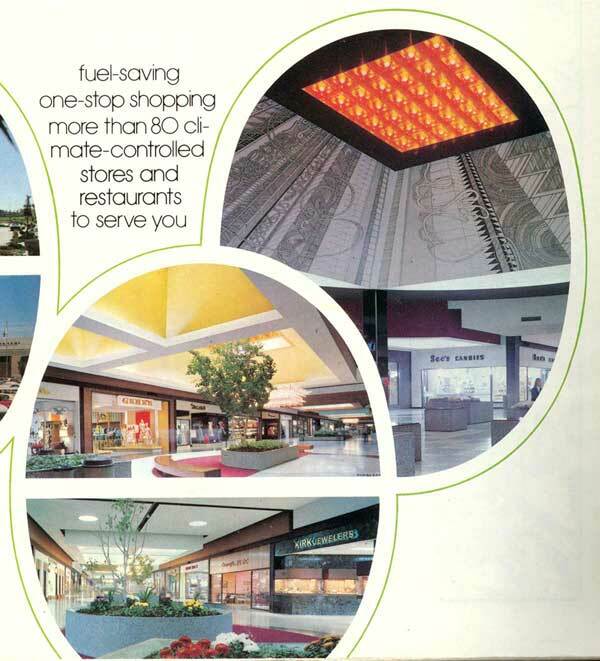 Unlike the exterior, the mall's original interior** had a bit of late 60's flair, albeit with a modernist touch. Colorful skylights, hanging light clusters, abstract, high-gloss flooring, bark-filled planters and wooden, semi-circular benches added a whimsical touch to the mall. "...we're interested because of the population growth and eventually we'll get there." 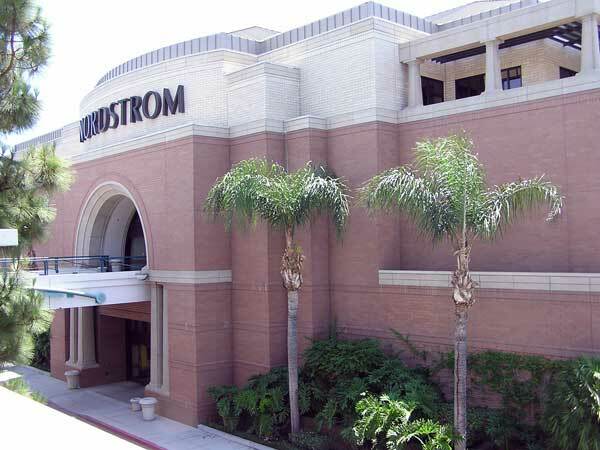 In 1987, following strong population growth in the region and a successful 1986 opening at a newly-expanded Montclair Plaza, Seattle-based Nordstrom began showing interest in Montclair's sibling mall in Riverside, which was also working to expand. 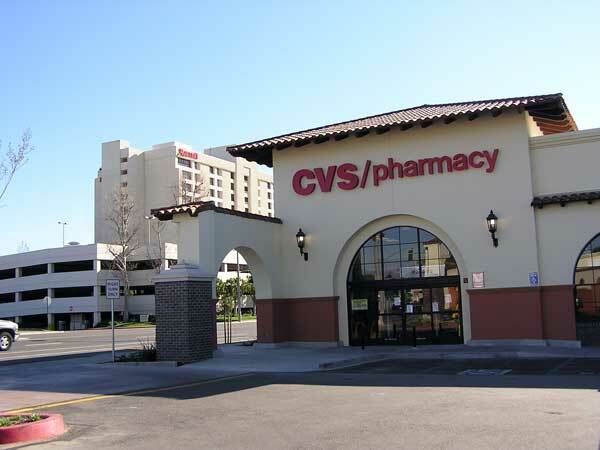 However, shoppers in Riverside would have to wait a few more years as obstacles threatened to derail the proposed expansion. 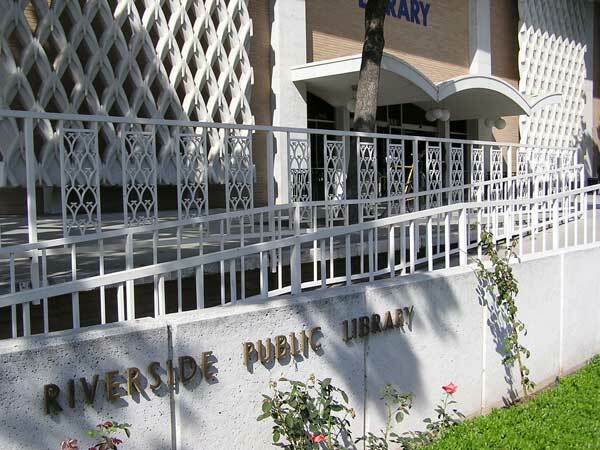 There's been some chatter recently of moving Riverside's "Central Library" from its current downtown site on Mission Inn Avenue to a location east of the 91 Freeway. We feel this would be a big mistake. 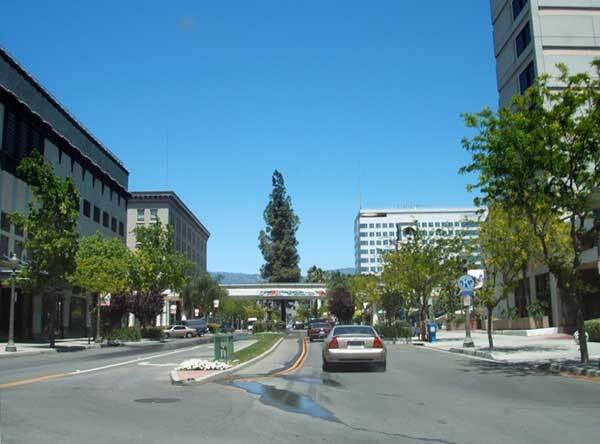 The notion began with a seemingly innocuous letter to the editor that appeared in the June 19th edition of The Press-Enterprise. 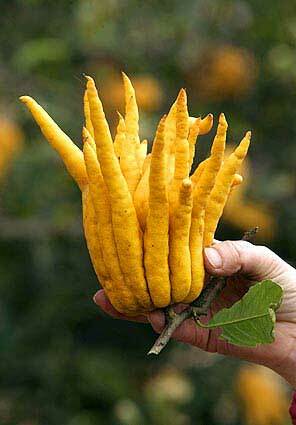 Initially, the letter received a smattering of support (one, two). 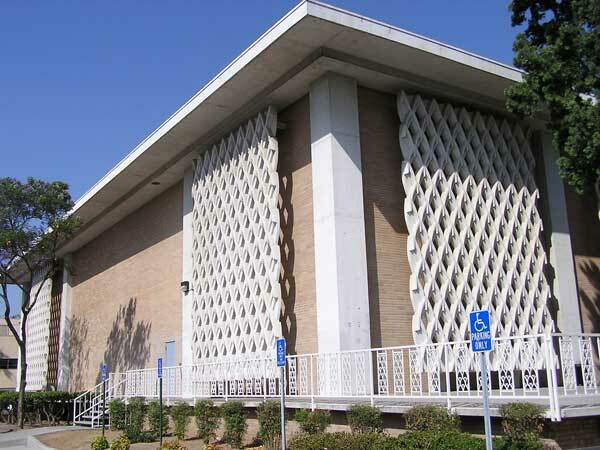 Although we agree the Eastside indeed could use an expanded library, moving the downtown branch is not the answer. Simply put, the Central Library plays a vital role in the city's reemerging downtown arts & culture community. 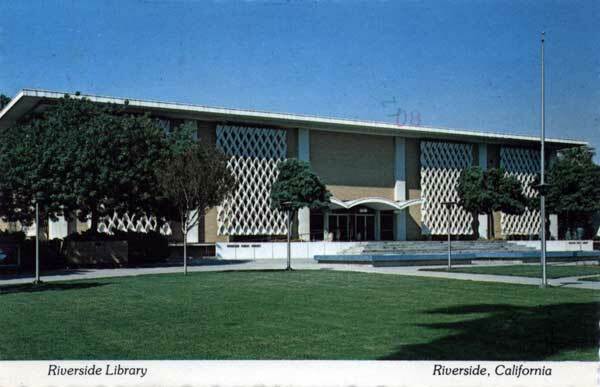 And as the main branch of the citywide system -- as well as being a primary governmental repository for Riverside County and the Inland region as a whole -- the Central Library should remain downtown where it is both expected and belongs. 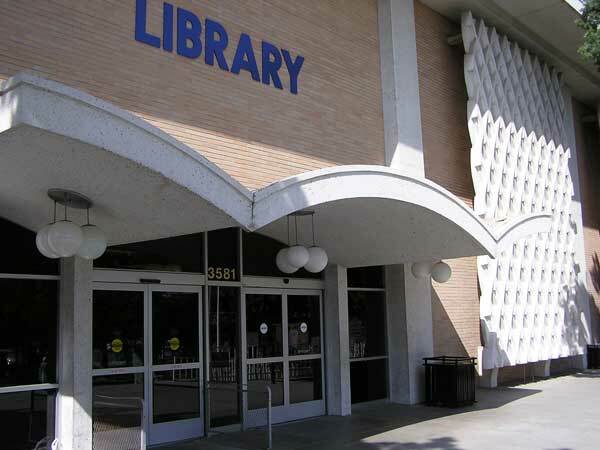 Moreover, the library is probably the best entity in drawing folks of all neighborhoods and of all classes to the downtown area, some of whom their only semi-regular exposure to downtown may in fact come from visiting the Central Library. And with a reemerging downtown, such wide-ranging exposure is critical for long-term stability. But, we must confess, this post goes beyond the relocation factor. We're about to broach a subject that has touched many a nerve since the "new" library replaced the old Carnegie in 1965. 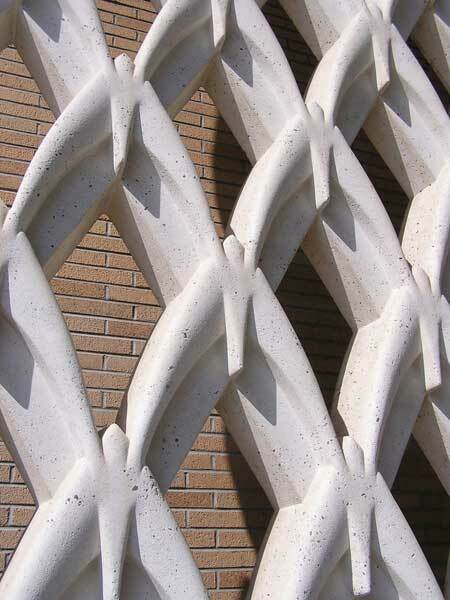 Although we agree its placement in the midst of historic architecture -- ranging from the eclectic Mission Inn to the ornate First Congretional Church -- is indeed a bit jarring, we also believe the building itself offers some of the best representation of mid-century, "new formalism" architecture within the entire Inland region. Such architecture may not be fully appreciated by older generations, but recent generations have grown up among such striking, modern architecture -- only to see it now quickly disappearing from the landscape. 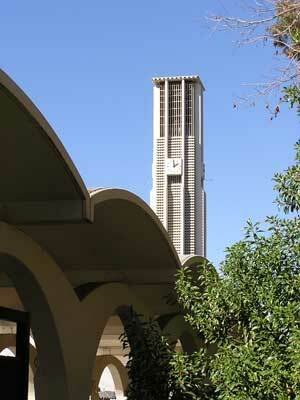 Moreover, though subjective as it is, who's to say such isn't the next "historic" architecture worth preserving? 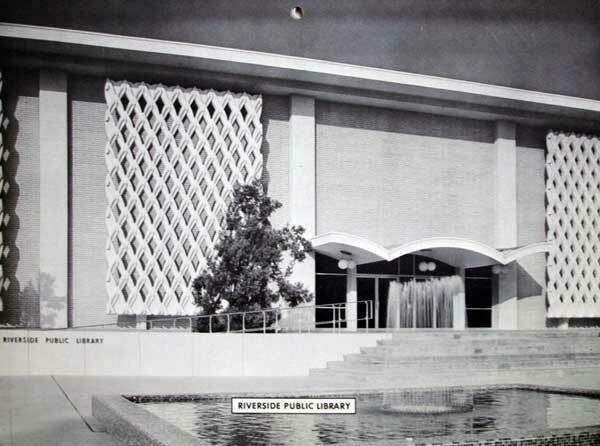 If anything can be said about losing the historic Carnegie and its eventual replacement with the modern facility, it is that it proved to be the catalyst which brought historic preservation to the forefront in Riverside. 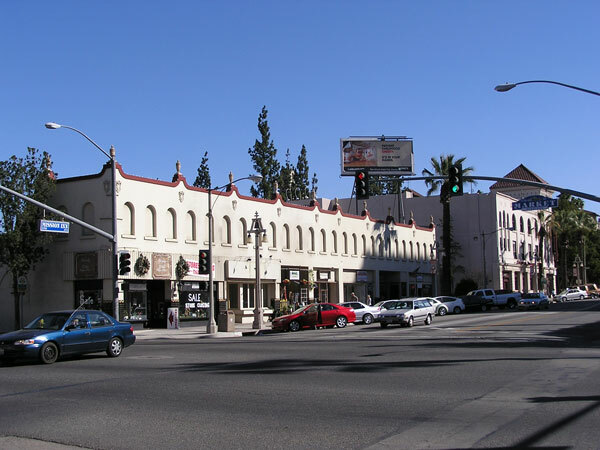 In fact, we have heard it said that it was the reason for the coalescence of historic preservation efforts during the 1960s, which played a pivotal role in preserving the Mission Inn in the 1970s and early 1980s. To lose such a real-life, existing reminder for future generations to see with their own eyes, in all its juxtapositional glory, we feel will only increase the likelihood of repeating similar mistakes. Finally, why not make the current Metropolitan Museum the "new" Central Library and the current Central Library the "new" Metropolitan Museum? Architecturally, the current library looks more like a museum of modern art while the current museum looks more like an historic library. All kidding aside, we believe the city's main library branch belongs downtown -- and nowhere else. Activity has picked up recently at 2 of 3 mixed-use projects under development in downtown Riverside, which will be the first combined residential/commercial projects within the city in several decades. At Raincross Promenade, bounded by First, Third, Main and Market streets, site clearing is well under way. Situated across from the city's convention center at Raincross Square, the site had been home to assorted auto repair shops, used car lots (1, 2), an aging "rental" motel as well as a few dilapidated homes and a couple of empty parcels. 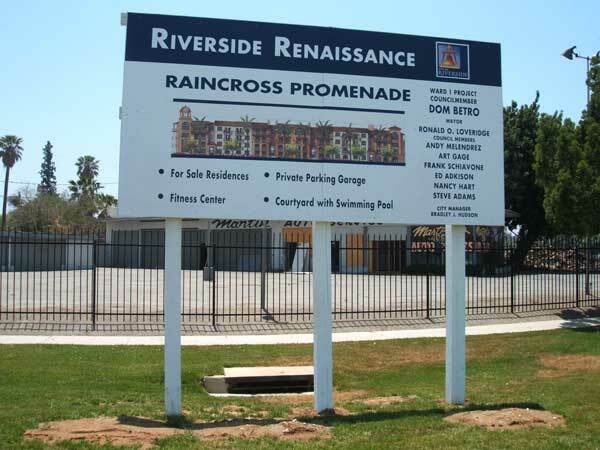 Planned by Los Angeles-based developer Mark Rubin, whom has developed various projects in Riverside, Raincross Promenade will add upwards of 250 urban-style residential units on 2-blocks that will essentially anchor the north end of the Main Street pedestrian mall. Although we have yet to see precise plans, our hope is the development is such that it "draws in" the existing pedestrian mall, which currently fizzles out at the convention center. Directly across Market Street, where developer Alan Mruvka is planning a similar mixed-use project, foundation work has begun on 10 live/work units as part of the first phase of m sole'. Mruvka plans upwards of 125 urban-style residential units in later phases, stretching along Market Street from Third to First streets (essentially mirroring Raincross Promenade). 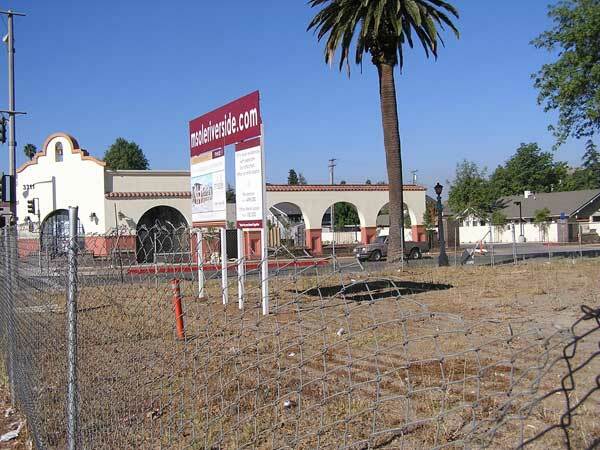 Thus far, m sole' is the only one of the three to begin actual construction, let alone offer pre-sales (an information studio is currently housed within the historic Sante Fe depot located near Mission Inn Avenue and Vine Street). 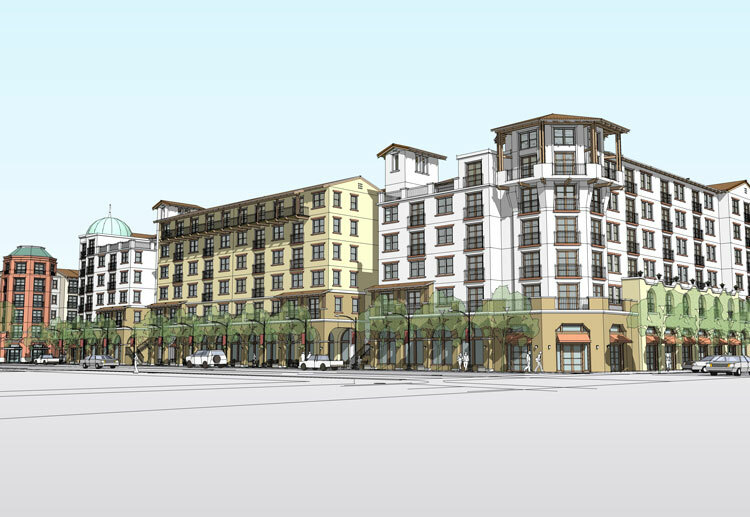 Yet to break ground is the third mixed-use development planned for downtown, this one the eagerly anticipated Fox Plaza located at Mission Inn and Market. Included in the multi-phase plans are upwards of 500 urban-style residential units, 65,000 square feet of retail and a 130-room, full-service hotel. 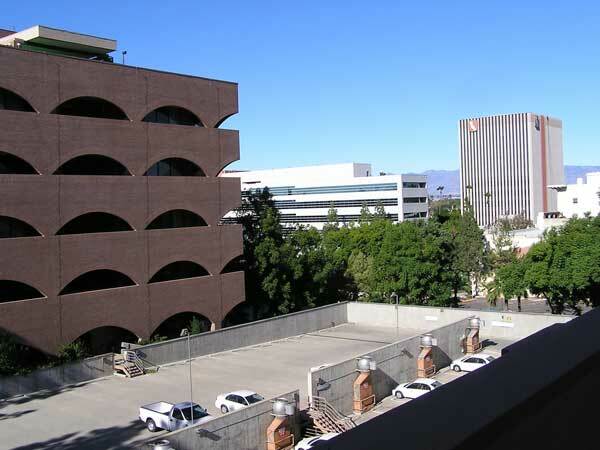 Currently, the site is occupied by the Stalder Building and various parking lots. 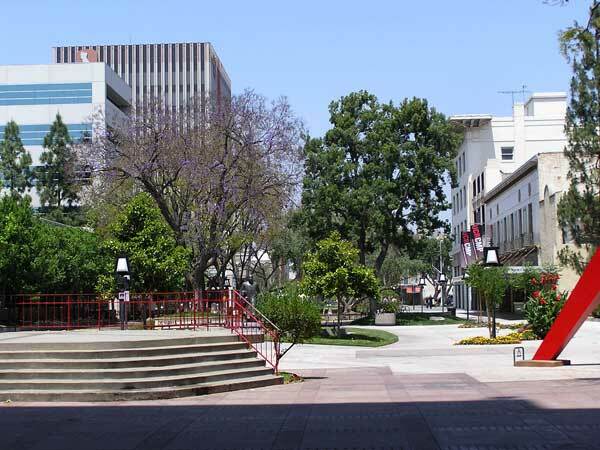 Situated near the heart of the pedestrian mall adjacent to restaurants, shops, museums and downtown offices -- not to mention some of the city's best historic architecture -- Fox Plaza will offer one of the few truly urban experiences within Inland Southern California. The one downside will be the loss of the historic Stalder, which once housed the city's first fire station. Although all three projects are within a few blocks of one another and each will indeed strengthen the city's re-emerging urban core, we feel Fox Plaza has the greatest potential. Moreover, we're glad to see alternative options being added to the area's predominantly single-family residential landscape. 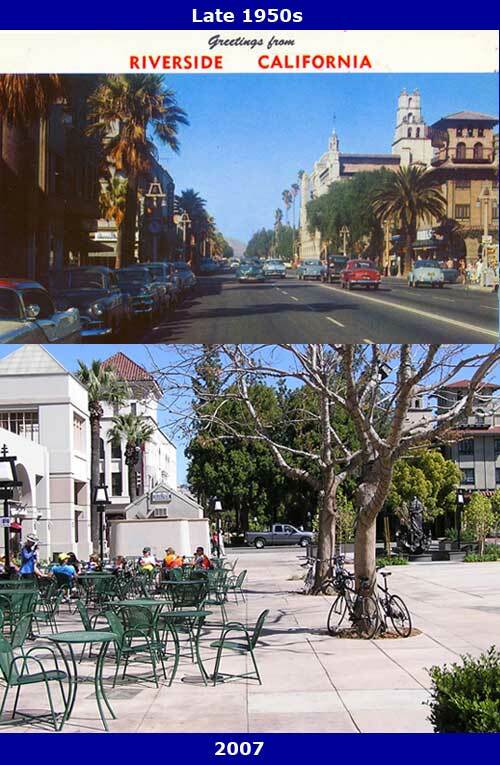 And, we feel no place is better for such options than within a genuinely historic downtown setting, one which needn't be "manufactured" nor "created" as is the case with many similar mixed-use developments around Southern California. 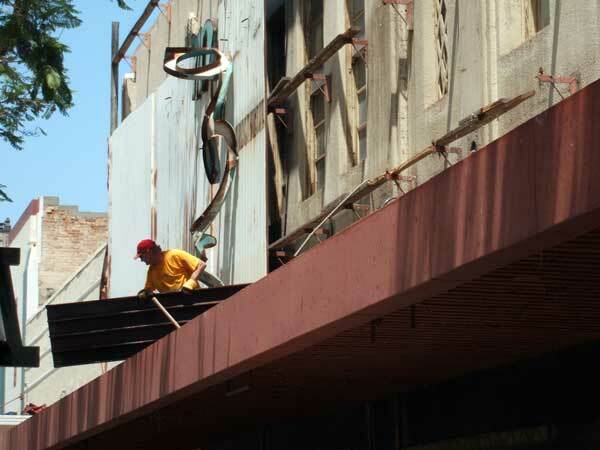 After 35 years of being seemingly frozen in time, the mid-century facade of the old Imperial Hardware Co. store in downtown Riverside is soon to be no more. 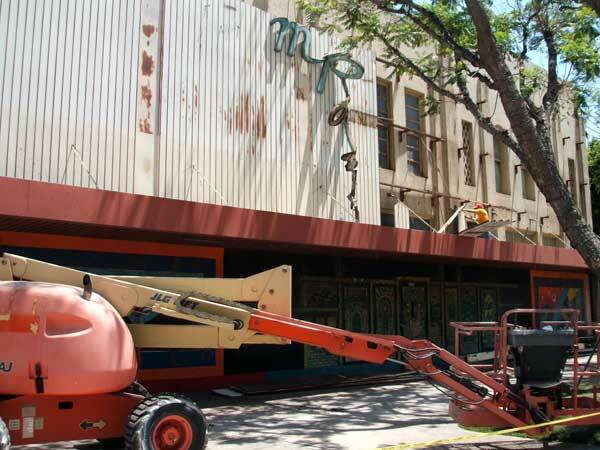 The city, which recently finalized purchase of the long-shuttered building, began dismantling Imperial's modern false front early Monday. By midday, nearly three-fourths of the aluminum covering had been removed, revealing the 1930s Art Deco facade of the former Westbrook's Hardware, which looked to be in surprisingly good shape. The building itself dates back to at least 1900 when Franzen Hardware opened within the current building located at 3750 Main Street. Owned by Henry and Chris Franzen, the hardware store was later sold in 1921 to R.H. Westbrook, whose family had become partners with the Franzen's in 1908. 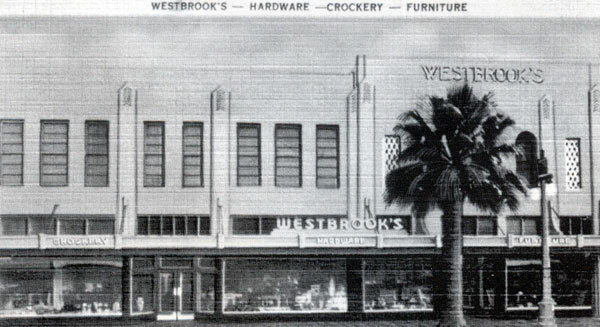 Following a 1935 fire that wiped out most of the store's stock, the building was refurbished, restocked and renamed Westbrook's Hardware. 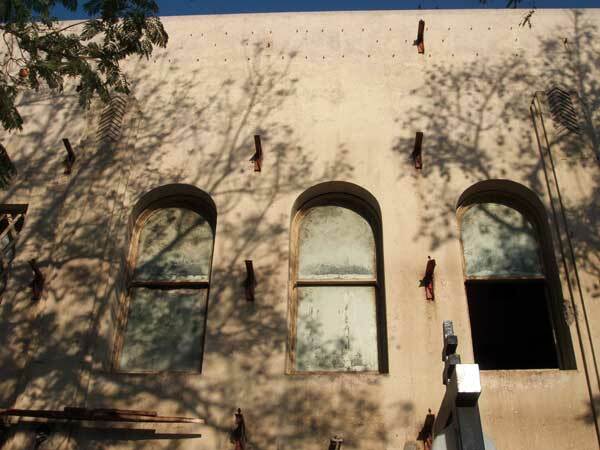 Part of the post-fire remodeling included the now-uncovered Art Deco facade. 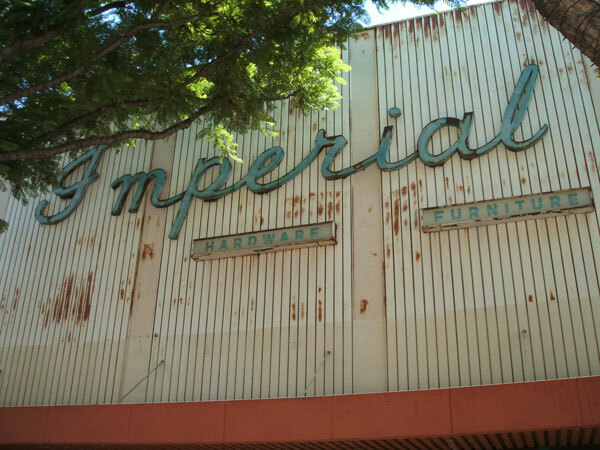 In 1959, the operation was again sold, this time to El Centro-based Imperial Hardware Co., a small chain of hardware & housewares stores in Southern California. Along with the sale soon came the now gone mid-century false front. 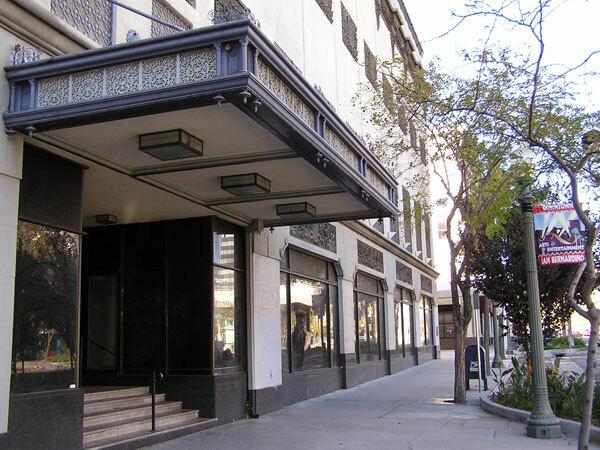 And yet, because the building's front remained unchanged for a number of years -- all the while other storefronts nearby had been refurbished -- the modern Imperial facade had become an iconic landmark of downtown in its own right. 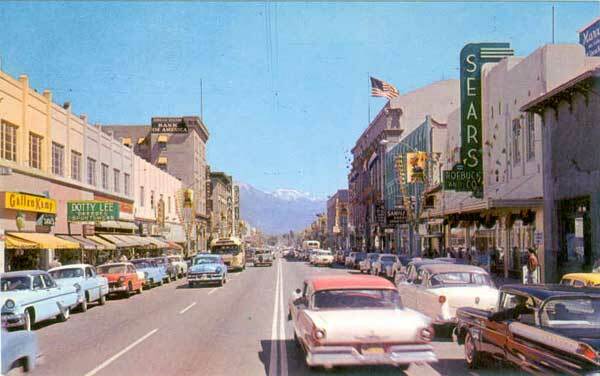 In essence, the facade stood as a relic harkening back to when downtown was still the epicenter for shopping. In recent years, the former store's front entrance has been adorned with colorful murals and art. Though we admit to initially having mixed feelings about the loss of the modern Imperial facade, no doubt what lurked beneath is quite a blessing itself. 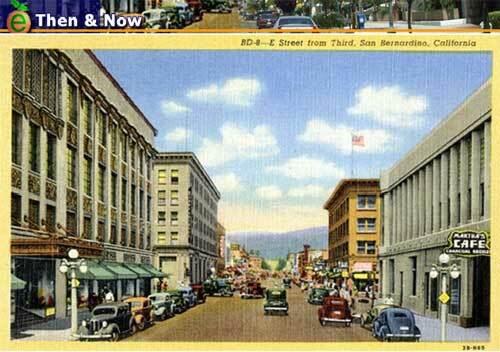 And if refurbished, will indeed add historic character to Riverside's pedestrian mall. Our hope is that the city, which has been courting potential retail and dining uses, is able to retain the Art Deco facade into any re-working of the building. Without a doubt, the spot near the center of the pedestrian mall offers a very unique opportunity, possibly for just the right national retailer -- such as a bookstore or mid-level restaurant -- which could help in drawing a larger presence to the resurgent pedestrian mall. We even feel a mixed-use development incorporating ground floor commercial topped with residential uses would work very well -- so long as much of the existing building's historic character could be worked into such a plan (which would greatly add to both nighttime and weekend activity along the pedestrian mall). Sunday, May 6, 2007 - Downtown Riverside was busier than usual this past weekend as both ends of Main Street hosted separate 3-day events. 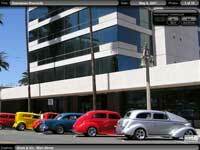 At the south end near the Riverside County Courthouse was the 9th annual "Show and Go" classic car show. Produced by Riverside East Rotary, the car and cruising event has steadily grown to showcase several hundred hot rods. Title sponsor for this year's event was Riverside-based K&N Filters. Just 5 blocks north down Main Street was the 2007 "Home & Garden Show" at the Riverside Convention Center at Raincross Square. The event featured everything from home improvement services to backyard patio and kitchen products. The show encompassed the entire interior of the convention center as well as the outdoor plaza adjacent to the Marriott. 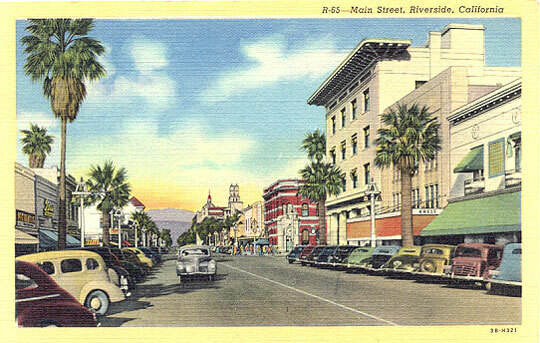 Although having the event spill out into the outdoor plaza helped entice folks strolling nearby into the show itself, it also displayed the need for an expanded convention center, which the city hopes to accomplish as part of the Riverside Renaissance Initiative. 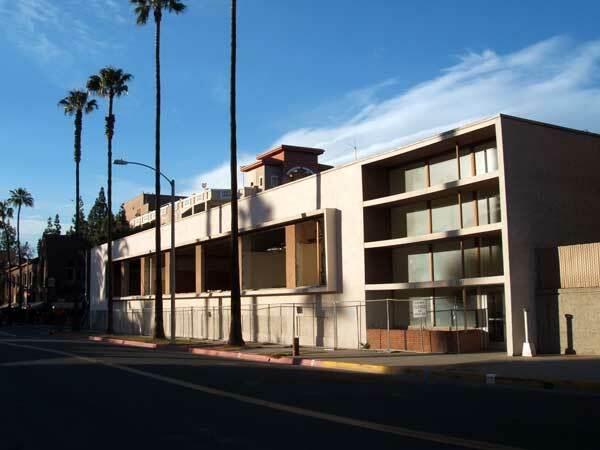 At 50,000 square feet, the 31-year-old Riverside Convention Center is half the size of the 10-year-old Ontario Convention Center. And although its interior is in relatively good shape, the exterior is indeed a bit bland and could use a face-lift. 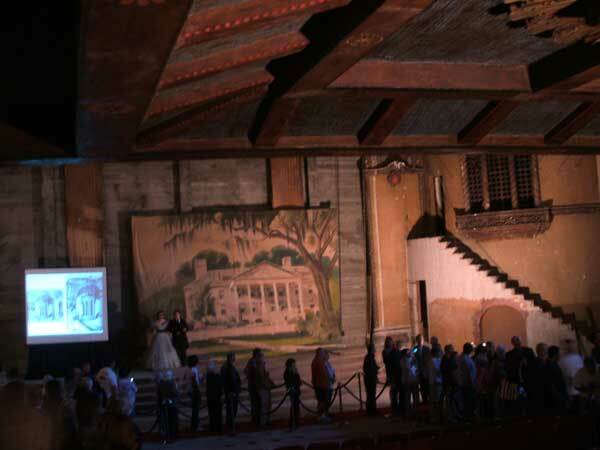 This past Thursday, the city of Riverside held a "Restoration Celebration" open house for the Fox Theater in downtown. 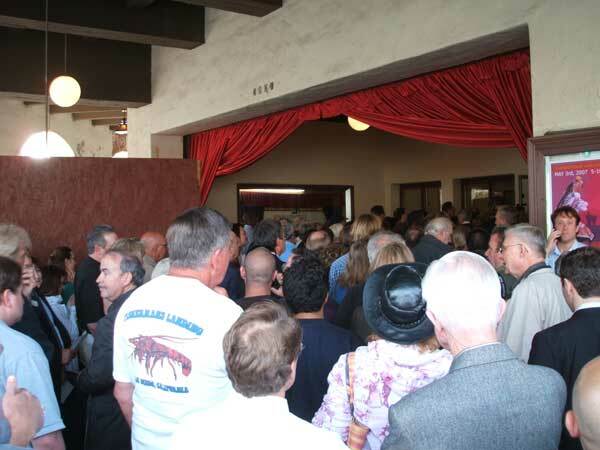 Over a thousand people showed up to take a sneak peek inside the long-shuttered theater prior to its forthcoming $30 million renovation into a 1,600 seat performing arts center, which is expected to be completed in December 2008. In attendance were Mayor Ron Loveridge, City Councilman Dom Betro and project architect Richard McCann of RFM Architecture, who has renovated Glendale's Alex Theater, the Pasadena Playhouse and the California Theater in San Bernardino. Also on hand was Joe Kobryner of the Nederlander Organization, which operates numerous theaters and venues across the nation, including 9 theaters in New York's Broadway district as well as the Pantages and Wilshire theaters in Los Angeles and The Grove in Anaheim. 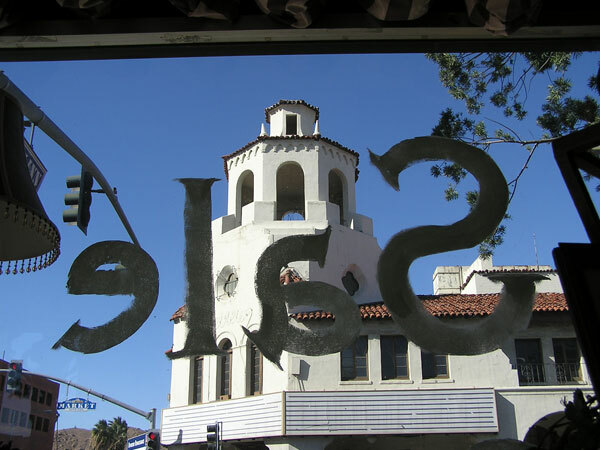 The Fox has long been a revered theater in Southern California. Opened in 1929 as the Riverside Theater, the venue's name was eventually changed to Riverside Fox Theater as part of the chain's West Coast Theaters group. Due to its proximity to Hollywood, the Fox became a favorite locale for movie test screenings, including the first public showing of "Gone with the Wind" in 1939. In 1942, the large backstage area was converted into a second smaller theater (The Lido). 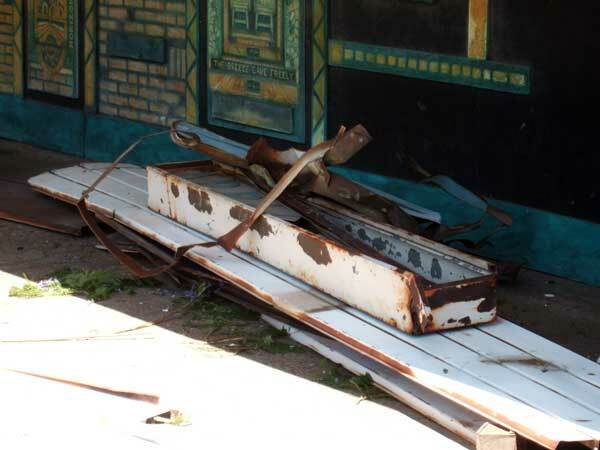 By the late 1970s, both the Fox and Lido had seen better days. The former began showing Spanish language films while the latter was relegated to adult fare. Since the early 1990s, the Fox has essentially been sitting empty with only limited use. As one of the cornerstones of the city's "Renaissance" plan, the Fox will play a key part in bolstering rising activities downtown, particularly at night. Although both weeknight and weekend activity has grown steadily over the past few years, a healthy performing arts center will no doubt help solidify downtown's reemergence. Judging by the conversations -- and the crowd -- at the open house, it appears we're not the only ones eagerly awaiting a rejuvenated Fox. And with both UCR and RCC performance arts schools in the works, downtown Riverside will soon have plenty of "artistic" company. 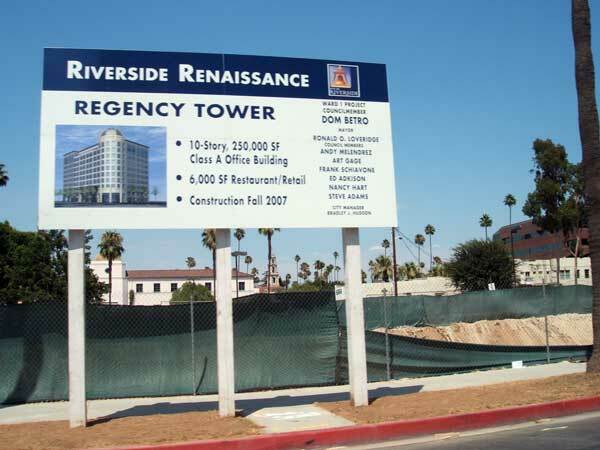 Site preparation has begun and construction is expected to start next month on Regency Tower in downtown Riverside, the city's largest downtown office project since the completion of Riverside Metro Center in 1990. 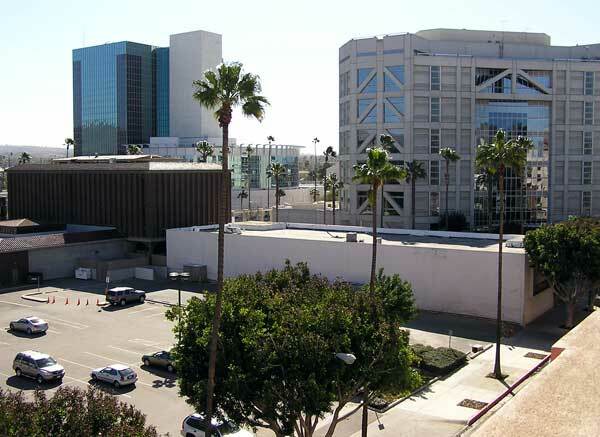 Situated at the corner of Tenth and Orange streets, Regency Tower will replace the recently demolished Riverside County Municipal Court building, a 1950s-era low-rise. Plans call for a ground floor coffee shop as well as a 3-level, underground parking structure accommodating 330 vehicles. Also planned is a second, smaller building -- possibly including a restaurant -- connected via a landscaped courtyard. The 10-story, 250,000 square foot office building is part of the city and county's efforts at redeveloping portions of downtown and will be the tallest structure built downtown since the 12-story Marriott (Sheraton) opened in 1987. 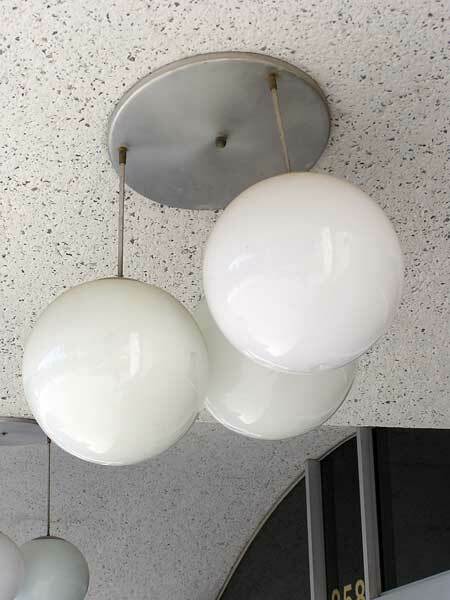 The most striking architectural feature will be a dome situated atop the building at the corner of Tenth and Orange streets, which adds a distinctive feature over the typical flat-roofed office buildings currently populating downtown. We're glad to see the coffee shop and other similar commercial uses planned within the mix, which will help spur more and varied interaction at the street level. Likewise, we're also glad to see underground parking as opposed to a separate, above-ground parking garage, or worse -- an asphalt lot. Regency Tower comes on the heels of the recently completed, 5-story office building for The Press-Enterprise newspaper. 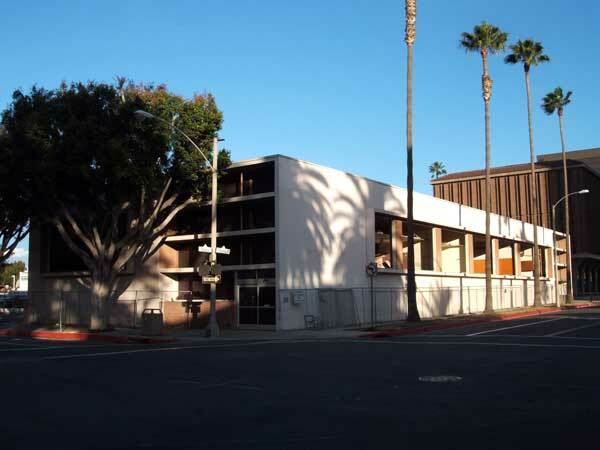 A second 5-story office project proposed for Olivewood Avenue near Fourteenth Street is in the early planning stages. Together, the three projects signal the end of a 15-plus year drought for larger, steel-framed downtown office buildings. Hopefully, the recent activity will spur other developers downtown as opposed to simply planting down more low-rises on the city's suburban fringe. 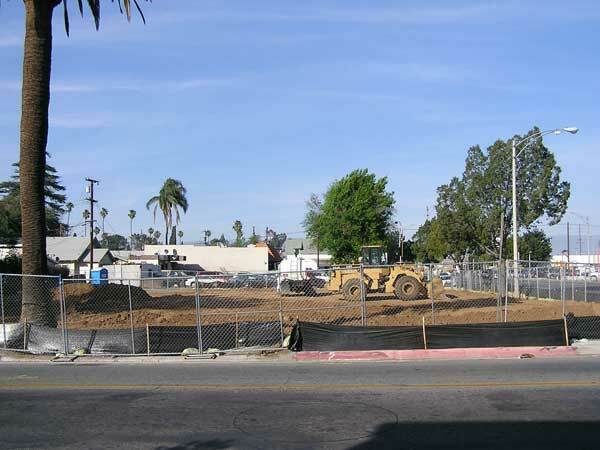 Grading began this past week on the first phase of the mixed-use m sole' project in downtown Riverside. When completed, m sole' will include up to 154 residential units and 7,000 square feet of ground-floor retail stretching along the west side of Market Street between Third and First streets. Phase one consists of 10 live/work units slated for the northwest corner of Third and Market streets -- near the convention center and across from the relatively new CVS and Starbucks. 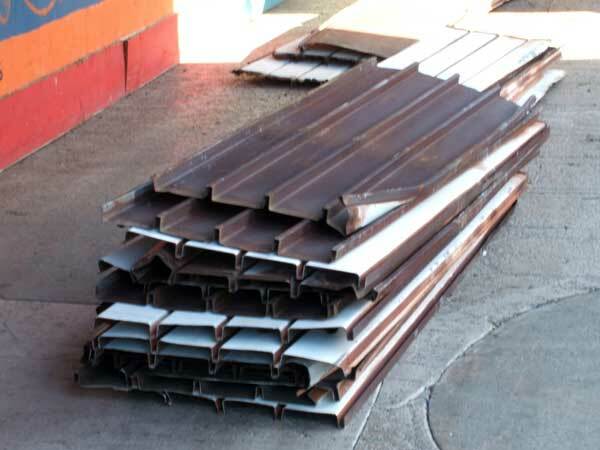 The units range in size from 1600 to 1850 sq. ft. (with work spaces of 200 to 600 sq. 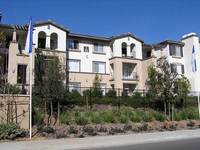 ft.) and are priced at $645,000 ($495,000 for the living space and $150,000 for the work space). Later phases of the project will include a 24-hour concierge desk, pool, clubhouse, fitness center as well as a wine cellar. Developer Alan Mruvka has opened an information studio located inside the historic Sante Fe depot located at the corner of Mission Inn and Sante Fe avenues. The $50 million m sole' development marks the beginning of what city planners envision as the transformation of six blocks of Market Street between Mission Inn Avenue and First Street. Two other mixed-use developments along this same strech of Market include Fox Plaza, which is scheduled to break ground shortly, and one planned by Los Angeles-based developer Mark Rubin. Already in the works is the $30 million renovation of the historic Fox Theater, which the city hopes to have completed by late 2008. 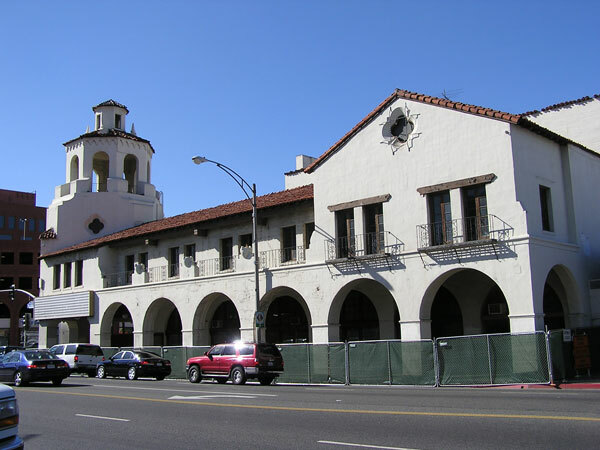 The 1929 theater, situated a block west of the historic Mission Inn, will be transformed into a 1,600 seat performing arts center. A new era has begun for Inland Southern California as ground was broken this week for the area's first major-league caliber sports/entertainment arena. 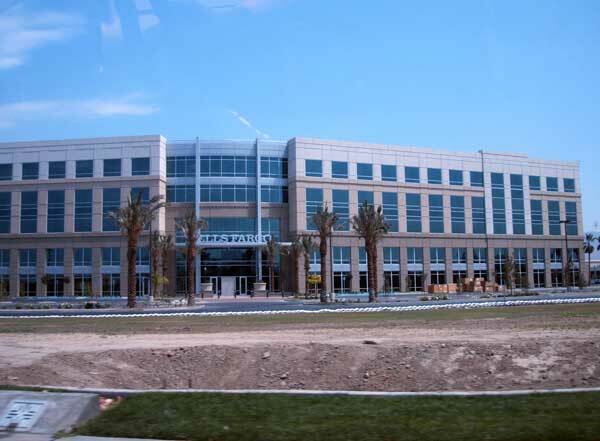 Located just west of Ontario Mills near the junction of I-10 and I-15, Citizens Business Bank Arena will rise on one of the last remaining parcels of the former Ontario Motor Speedway. As the centerpiece for the planned Piemonte at Ontario Center, the arena -- with a capacity of 11,000, including 36 luxury suites -- will be owned by the city of Ontario and managed by Los Angeles-based AEG, whom also operate the Staples Center in downtown Los Angeles. The deal with AEG guarantees a minimum 120 events per year, many of which AEG says will be acts it also books for Staples. Also on tap is a minor-league hockey and/or basketball franchise (farm teams from both the Los Angeles Lakers and Kings have been mentioned as likely tenants). "This is going to create an atmosphere of entertainment that the Inland Empire has been craving for a long time," (Ontario Mayor Paul) Leon told a crowd of invited guests gathered at the site. 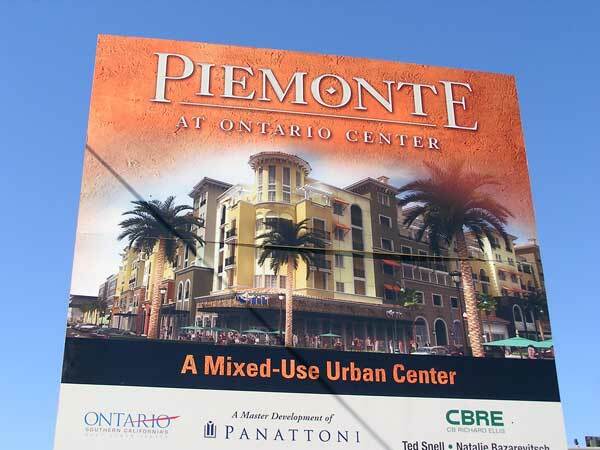 ... "It's going to do so much not just for Ontario, but for the entire region," (Ontario Councilman Alan) Wapner said. ... "With southern California as AEG's headquarters, we are clearly aware of the demographics and the necessity for a state of the art sports and entertainment arena in Ontario and the Inland Empire," said Timothy J. Leiweke, President & CEO, AEG. Coupled with the area's continuing population growth and fast-rising demographics, the long-awaited arena for Inland Southern California reaffirms the region's growing prosperity and maturity within Greater Los Angeles. Considering a local population base of 4 million, our only real complaint is that it has taken this long for such a venue to be built. No doubt the pent-up demand for major entertainment options locally will make the arena successful, likely to the surprise -- and chagrin -- of some LA naysayers. The grand opening for the $130 milion, 225,000 square foot arena is expected in October 2008. Could a major-league franchise be far behind? UC Riverside scientists have developed some best-selling fruits, including the Oroblanco grapefruit-pummelo hybrid, with its surprisingly sweet taste, and the tangy Gold Nugget mandarin. But many of the university's contributions have been more utilitarian, such as finding ways to eliminate bothersome bugs without pesticides. 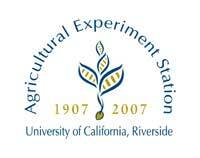 The 400-acre station is now called the Citrus Research Center and Agricultural Experiment Station to reflect its expanded mission, which now includes research on asparagus and other vegetables. 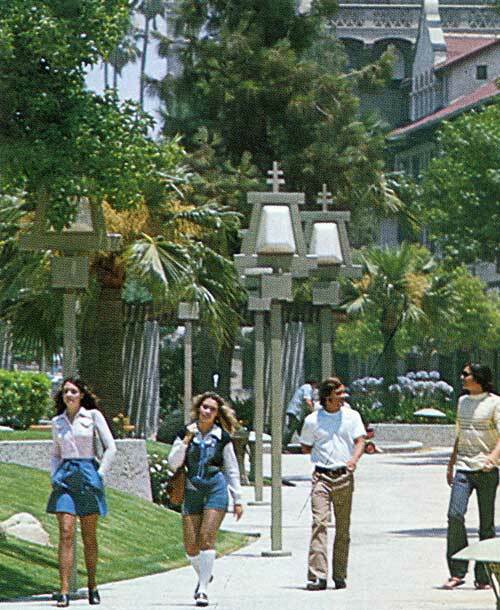 Established by the State of California during the region's citrus heyday, the research station planted the seeds for present-day UCR, which began accepting students in 1954 and officially became a general campus of the world-renown UC system in 1959. "When you're there, you feel like you're taking a trip around the world. She's got stuff from Morocco in one row, then in another row she's got Spain and Egypt ... stuff that no one else in the United States has." Plans for redeveloping a struggling mall in downtown San Bernardino moved a step closer this week as Miami-based LNR Property Corporation submitted draft environmental documents for replacing the 35-year-old, Victor Gruen-designed mall with a mixture of residential and commercial uses. Tentatively called "Court Street West," plans are for up to 750 residential units, mostly condos, townhomes and lofts, plus approximately 120,000 square feet of commercial space set within an urban, park-like setting. Plans also call for reconnecting F and G streets back through the mall property. However, still not included in the redevelopment are the former JCPenney and empty Harris Co. department store buildings, both of which were not part of LNR's purchase of the mall in Feb. 2006. Their status remains up in the air (though a buyer for the historic 1927 Harris' building is likely at some point). 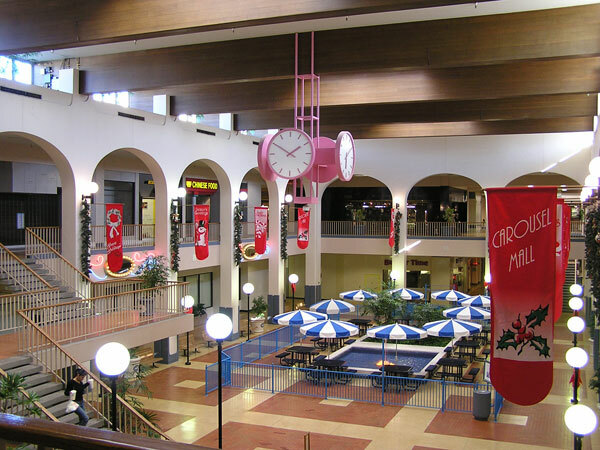 Planned in the late 1960s as a redevelopment project between the city and federal government, Carousel Mall opened as Central City Mall in 1972. 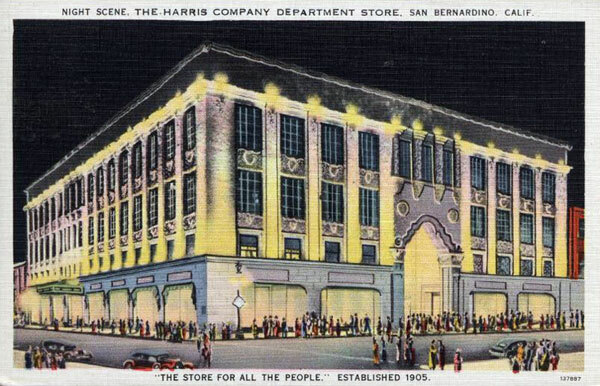 Built adjacent to the flagship department store of San Bernardino-based Harris Co., the two-level mall helped keep downtown alive following the 1966 opening of nearby Inland Center Mall. Future plans for the immediate area included commercial high-rises and a "central city park" (just across E Street adjacent to City Hall). The plan even envisioned an aerial tram of sorts shuttling patrons among the two competing malls, which were separated by a mere two miles. Over the next 20 years, as San Bernardino struggled with growing unemployment, poverty and crime, Central City Mall began a steady downward slide. 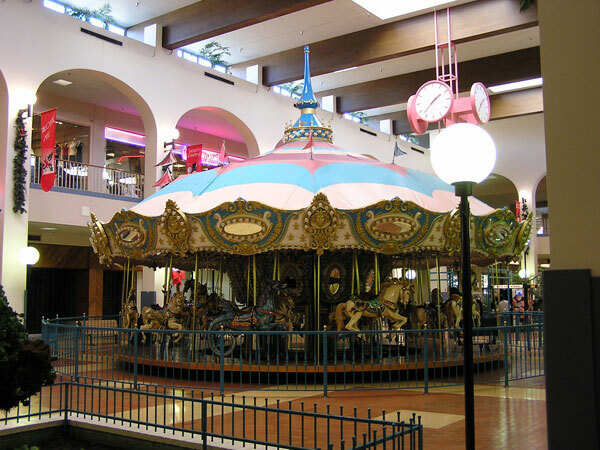 A 1991 renovation, which added a carousel and a new name, temporarily boosted retail traffic. However, the 1996 opening of the gigantic Ontario Mills Mall 10 miles to the west began to put strains on the now Carousel Mall. 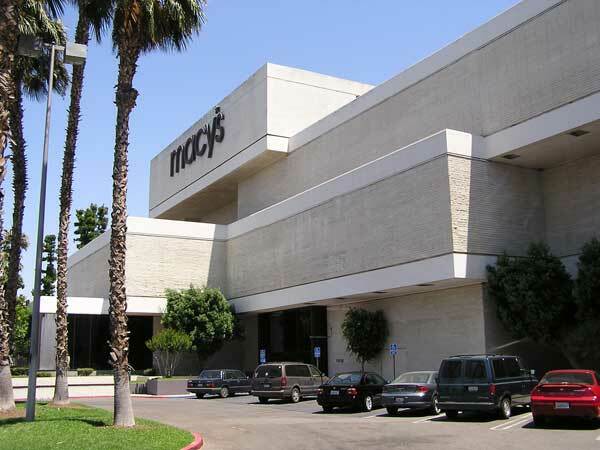 In 2000, two years following the purchase -- and eventual merger -- of the Harris' chain into Fresno-based Gottschalks, the closing of the flagship Harris' store signaled the beginning of the end for the mall. 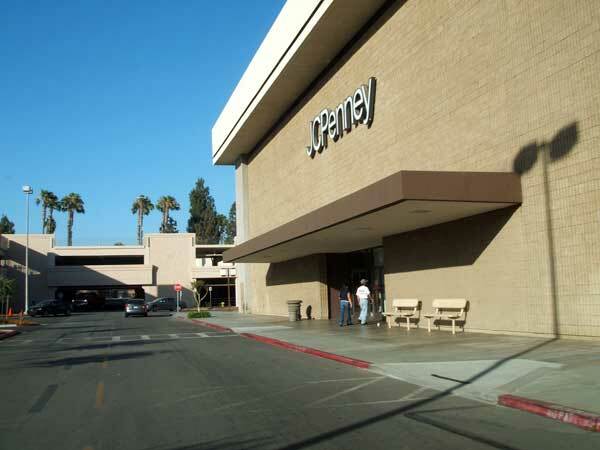 Within three years, both Montgomery Ward (2002) and JCPenney (2003) would follow suit and close up shop in San Bernardino. Today the Carousel Mall is a virtual ghost town of sorts. Although the city did manage to fill some of the empty tenant space with a few government agencies and even secured a Starwood Hotels & Resorts reservation center (with 400-plus jobs), the mall's remaining retailers continue to struggle. 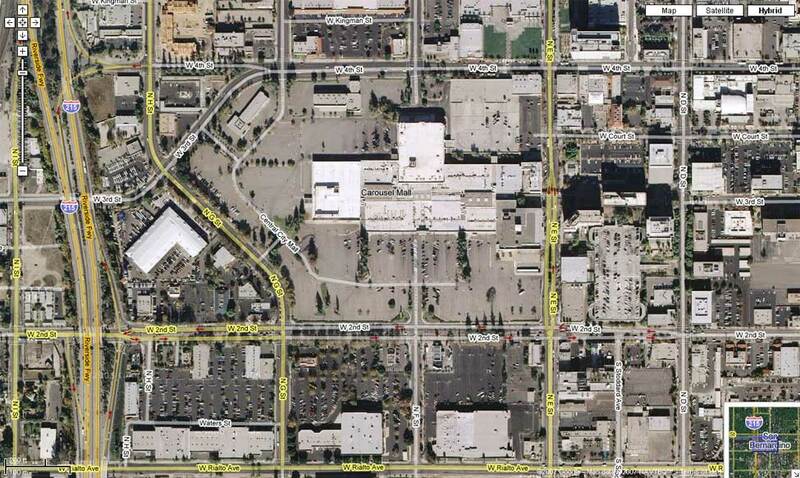 Without a doubt, the large mall property in the heart of downtown offers the city a unique opportunity for a large-scale, mixed-use development. 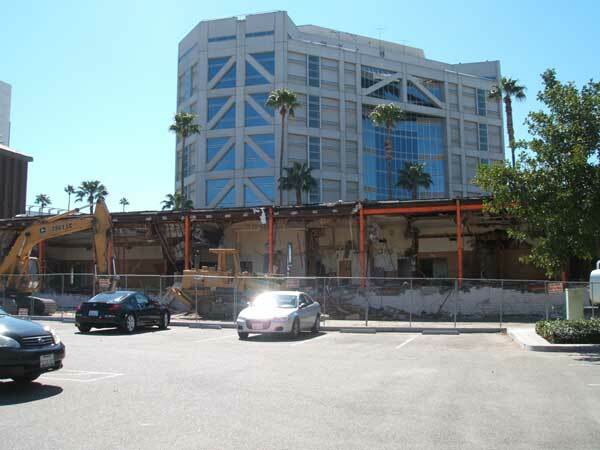 We look forward to watching this redevelopment, though we hope the historic Harris Co. building is indeed incorporated into any plans and does not give way to the bulldozer. 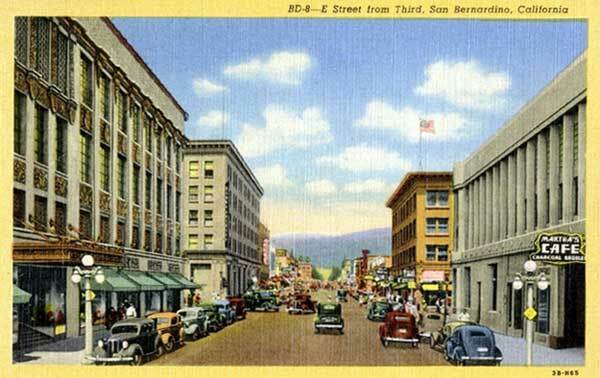 Hopefully, both LNR and San Bernardino will be able to take advantage of the situation and help bring vibrancy back to a once-thriving downtown. Sunday, January 21, 2007 - If one visits downtown Riverside, as we did today, they will notice the historic Fox Theatre is now fenced off, awaiting a $30 million renovation. As one of the centerpieces of the $780 million Riverside Renaissance Initiative -- which outlines 25 years worth of citywide projects in about 5 -- the Fox will receive a complete makeover, transforming it into 1,600 seat performing arts center. Opened in 1929, the Riverside Fox was once a favorite place for Hollywood studios to screen movies prior to their release. Studio executives felt the area better represented American audiences more so than patrons in Hollywood. One such sneak preview was "Gone With the Wind" in 1939. Across the street from the Fox Theatre is the Stalder Building, which is actually three buildings unified into one facade via a 1926 renovation. A portion of the building once housed the city's first permanent fire station (1890s). 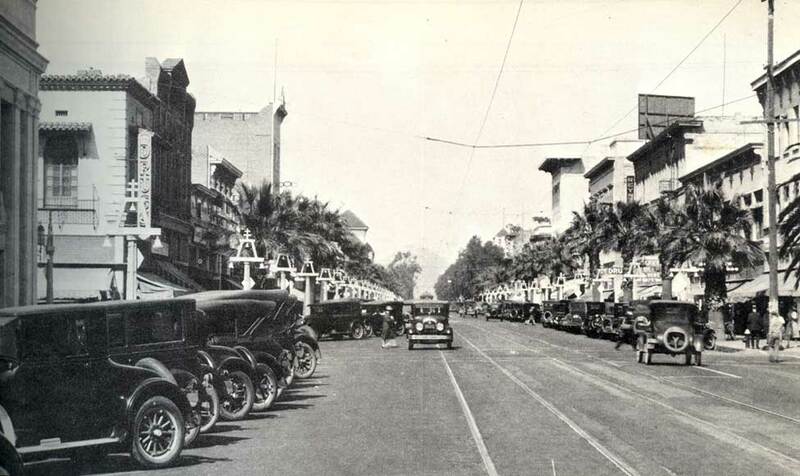 Over the years, the configuration of the building has been significantly altered, resulting in as many as 8 storefronts along Mission Inn Avenue plus a few along Market Street. 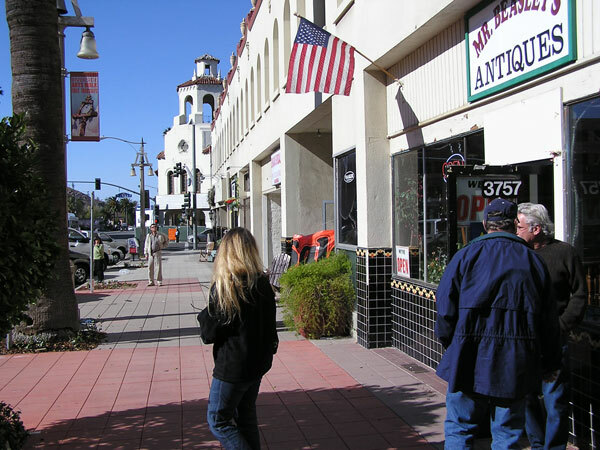 Recently, it has become a mix of mostly small antique shops, including the popular Mr. Beasley's. Come March 1st, however, the stores will be fully vacated in preparation for Fox Plaza, a mixed-use development planned for the site that includes residential and commercial with underground parking. 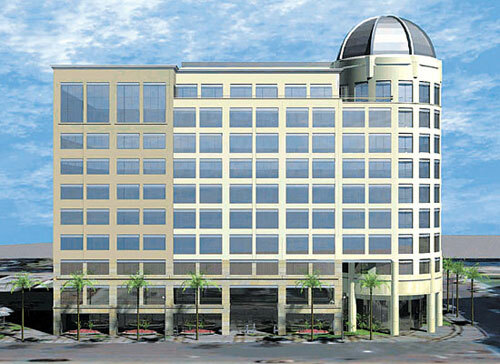 Expected to break ground in 2007, Fox Plaza is a $200 million development that when fully built will add 500 residential units and 65,000 square feet of retail space along two blocks of Market Street from Mission Inn Avenue to Fifth Street. Also included in the 2-phase plan is a 130 room, full-service hotel. Though it's difficult to see one of Riverside's oldest buildings come down, we're eagerly anticipating Fox Plaza, which no doubt will be a significant and unique addition to downtown. 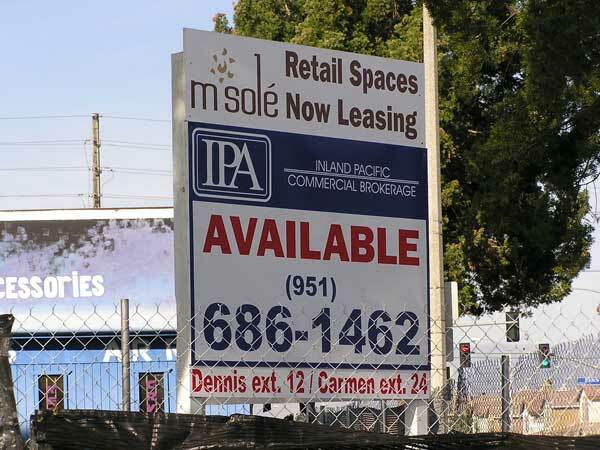 If Riverside truly hopes to have a more balanced and livlier downtown, particularly after 5 p.m., developments such as Fox Plaza and m sole that include residential units are indeed necessary. 2006 is the previous archive. 2008 is the next archive.